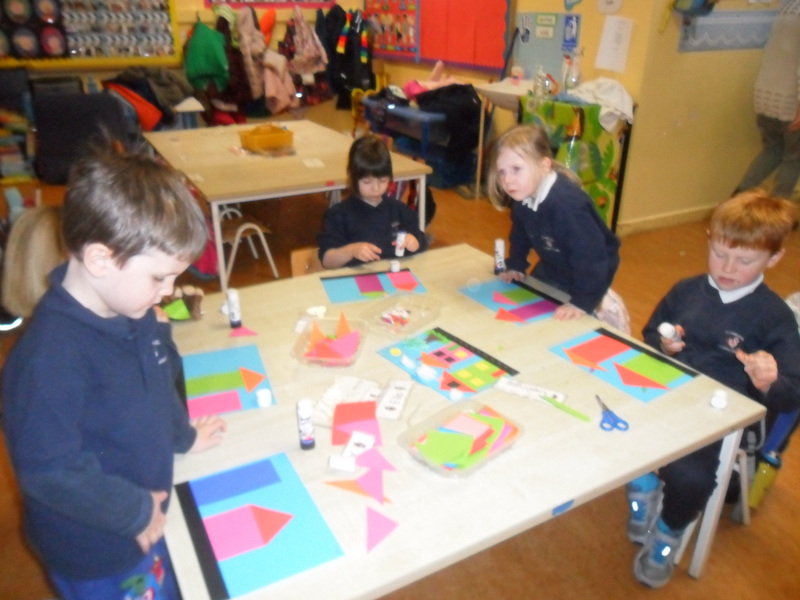 Second Class have been busy! 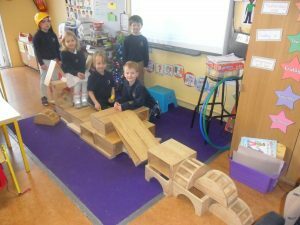 March 13, 2017 / Katie Fox / Comments Off on Second Class have been busy! 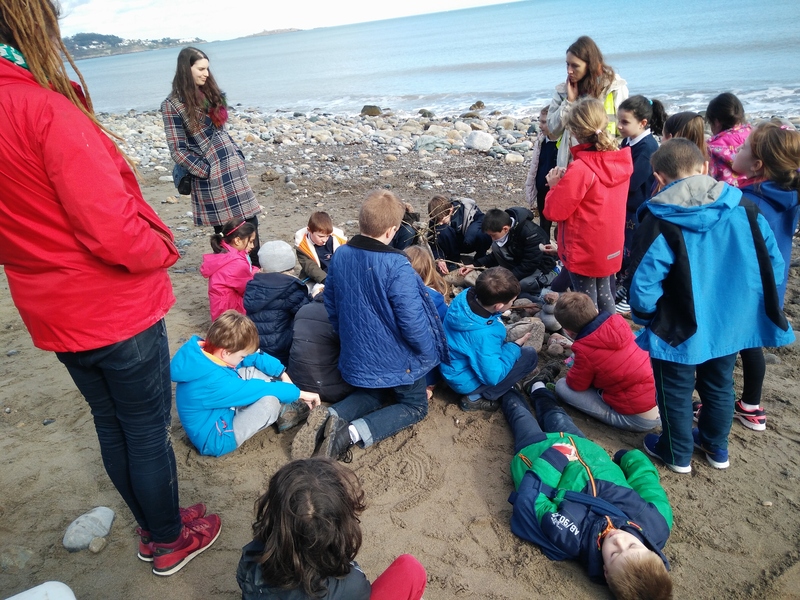 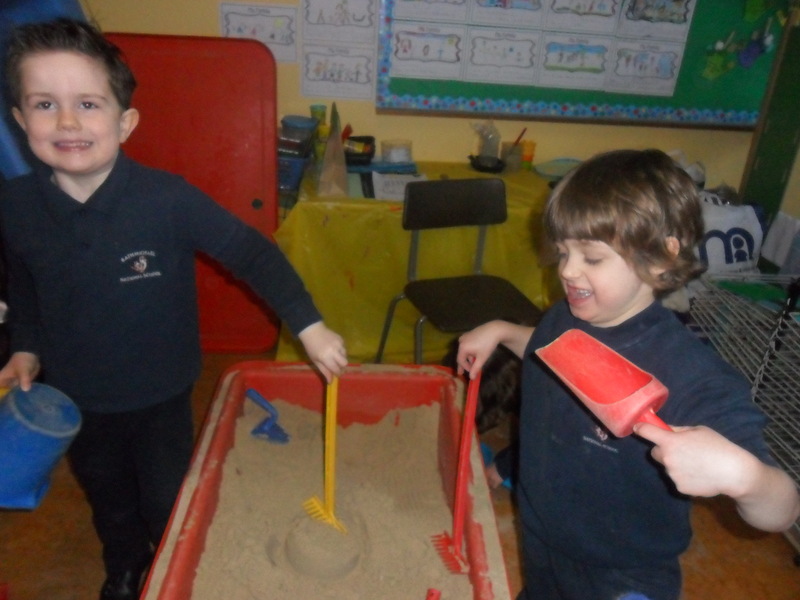 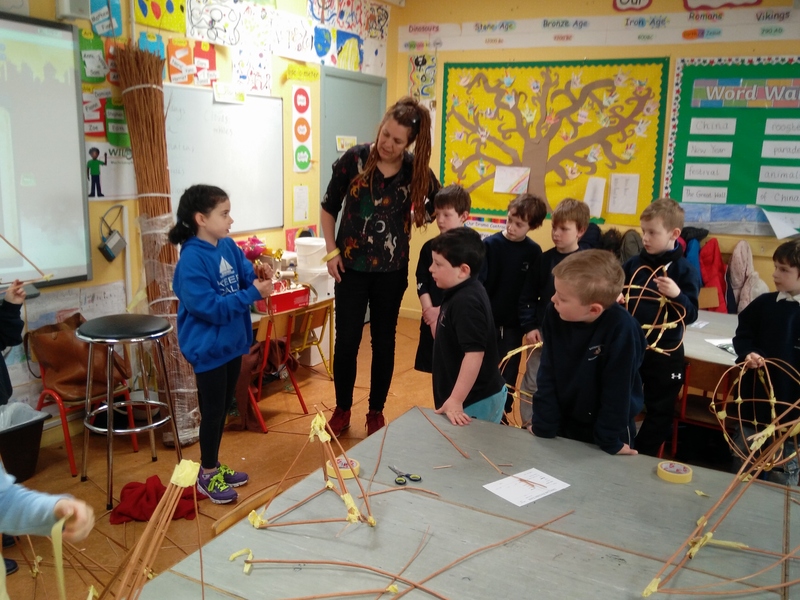 Second class went on a trip to Shankill beach as part of our Creative Classrooms programme. 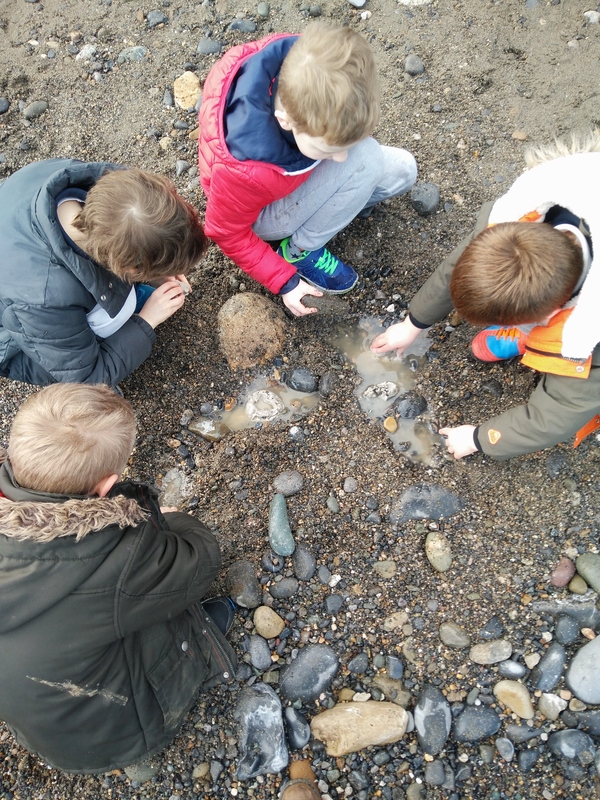 We searched for treasures and created a sculpture on the beach. Here are some more creative classroom pictures:We used willow to create some 3D shapes in groups. 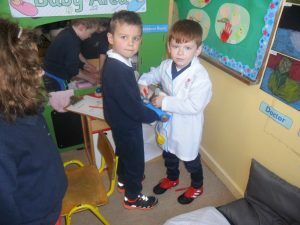 Look at the super scientists in second class. 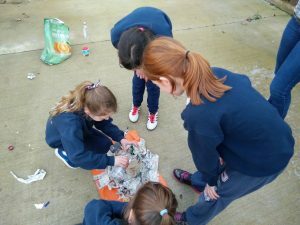 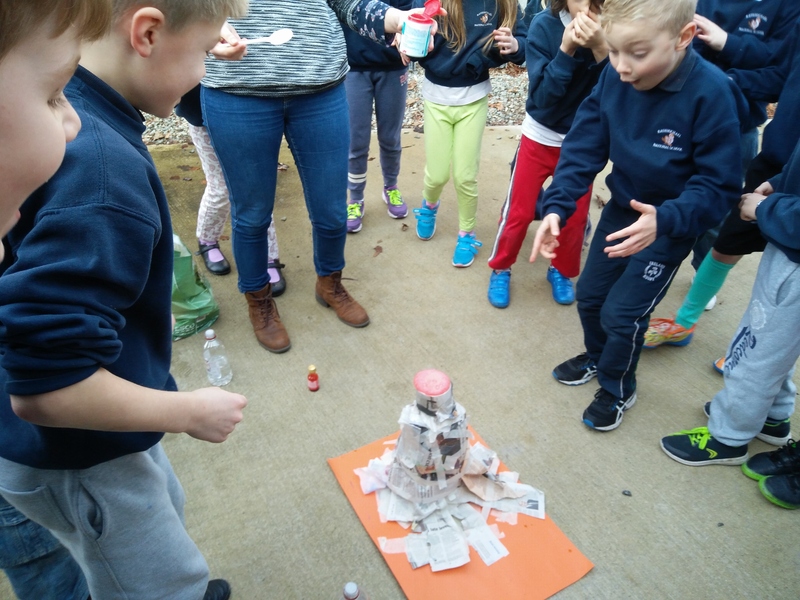 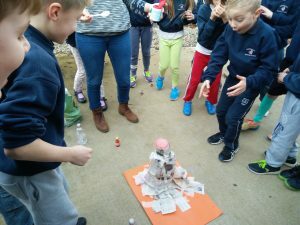 We used bottles and newspaper to create volcanos. 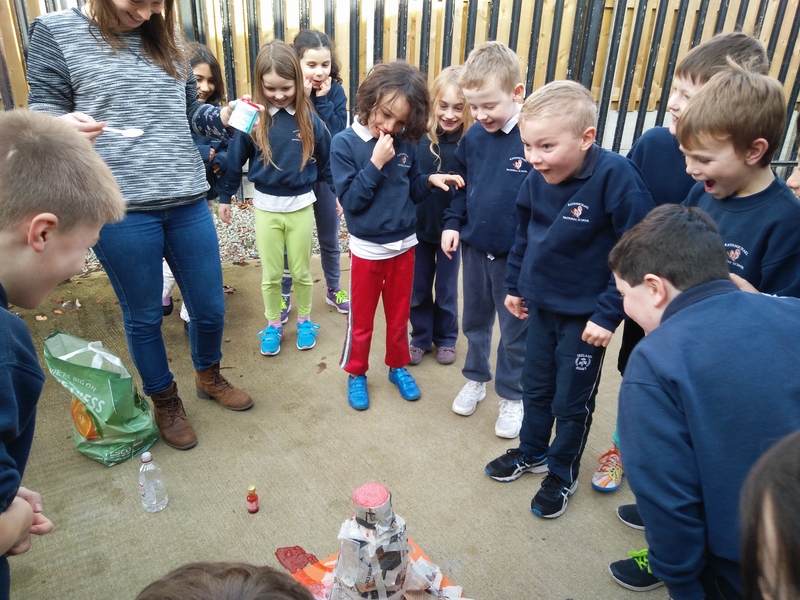 Then we mixed vinegar and baking soda with some red food colouring to make the volcanos erupt! 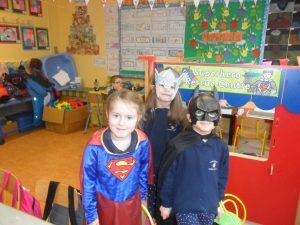 The theme for February’s Aistear was Fantasy and Fairytales. We had great fun with this theme for the three weeks as it involved a lot of dressing up! 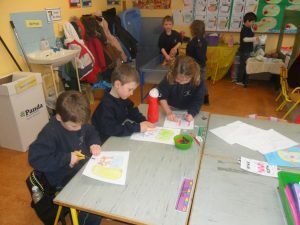 During the month we read and discussed lots of fairytale stories. 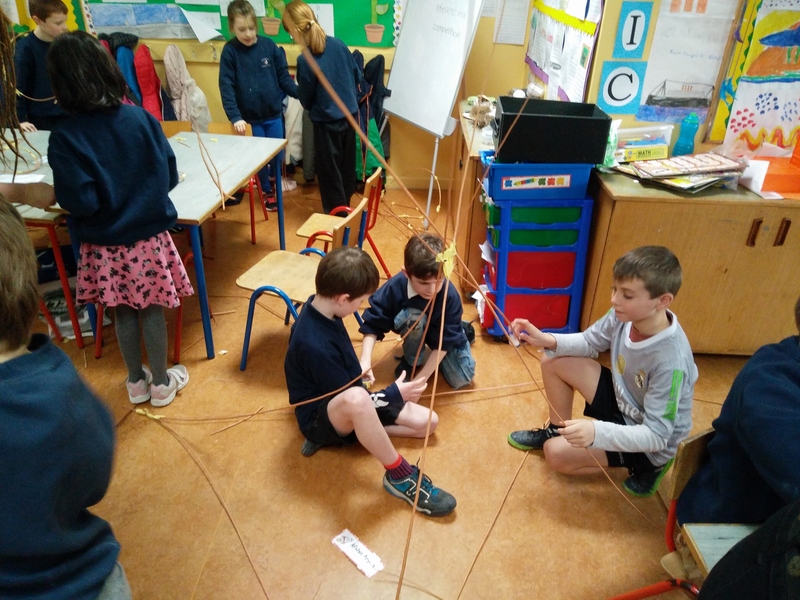 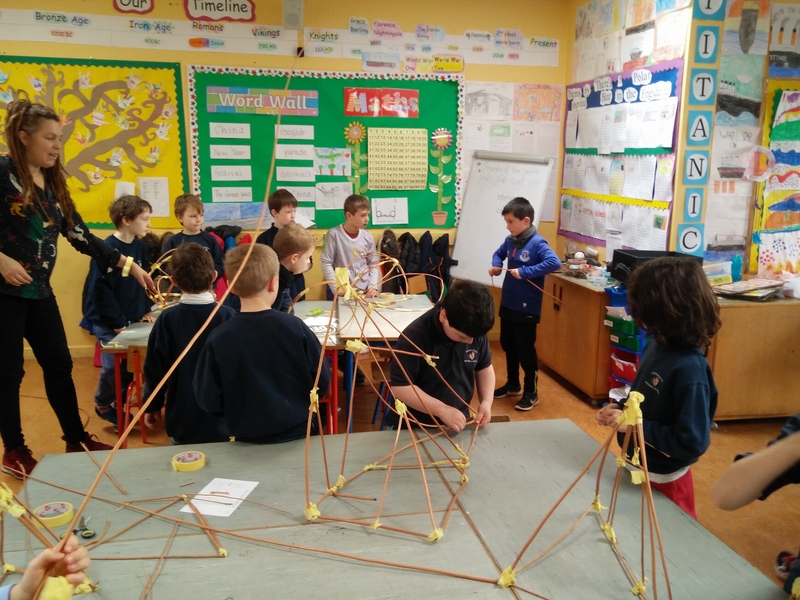 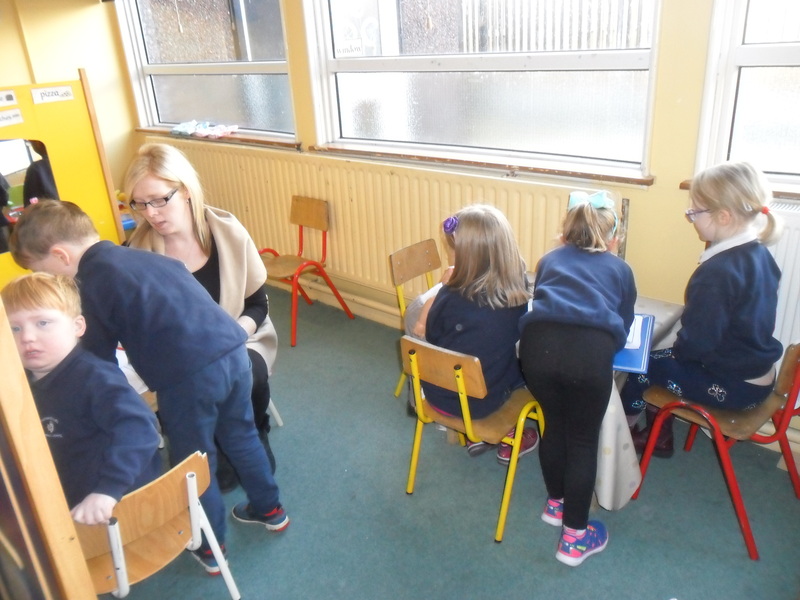 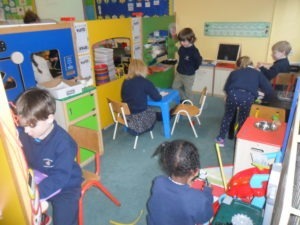 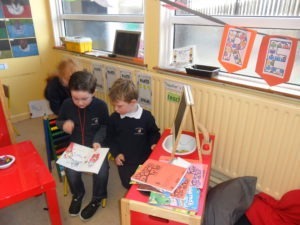 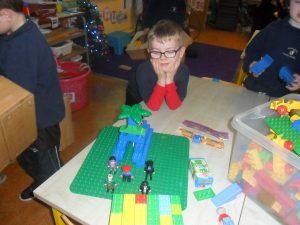 The class focused mainly on the books ‘Cinderella’ by Niamh Sharkey, ‘Into the Forest’ by Anthony Browne and ‘The Three Billy Goats Gruff’, which were read as part of the Story-Station in Aistear. We examined what is usually needed to make a good fairytale and then we created and wrote out our own unique fairytales using prompt cards and a dice. 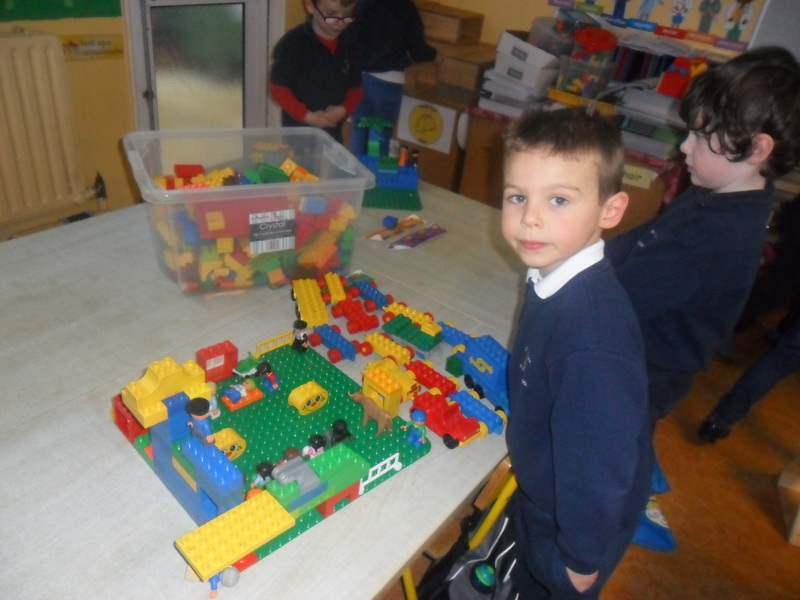 We learned about the features and rooms within a castle. We explored which materials were waterproof and non-waterproof by experimenting and finding a suitable material to create our own umbrellas. 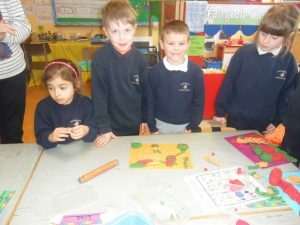 We sequenced events and created maps of the journey taken in the story ‘Into the Forest’. 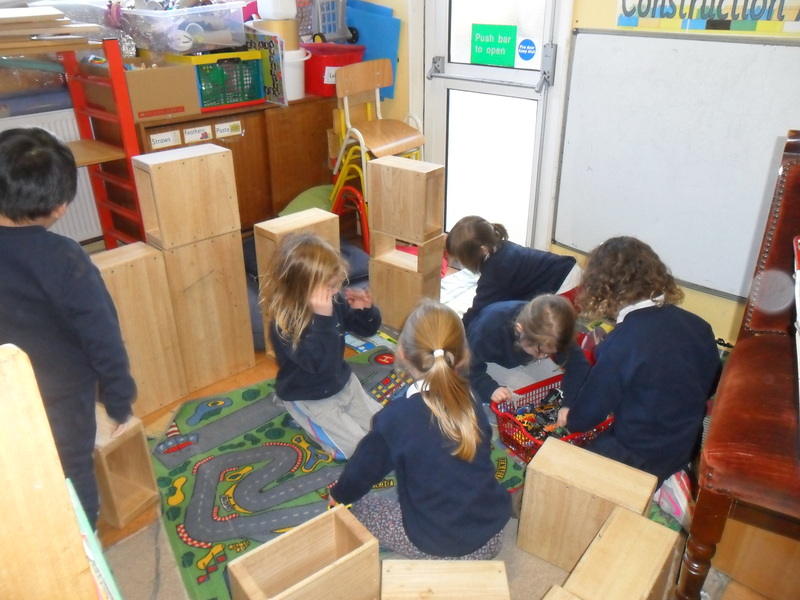 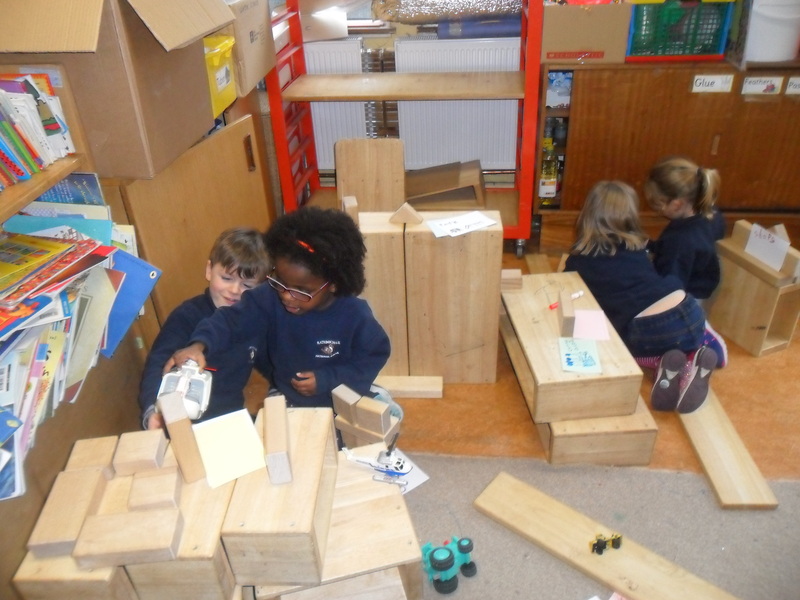 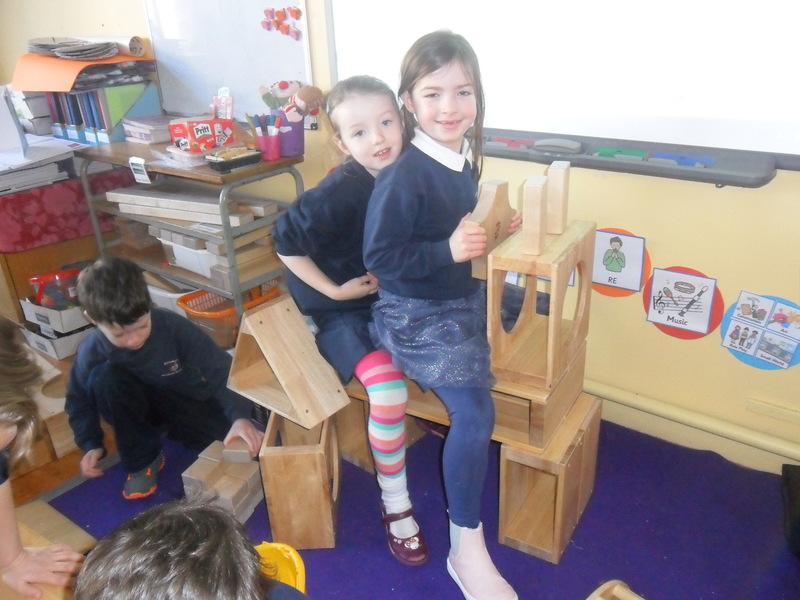 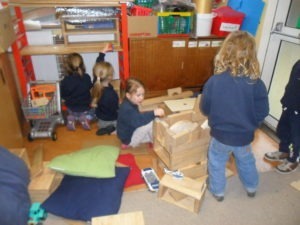 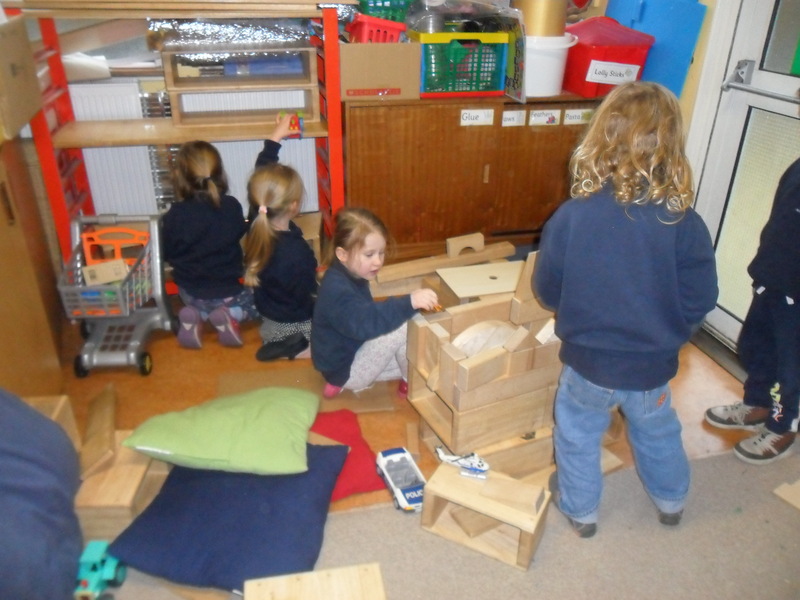 At the Construction Corner the groups worked collaboratively to make superhero transport from the large wooden blocks. 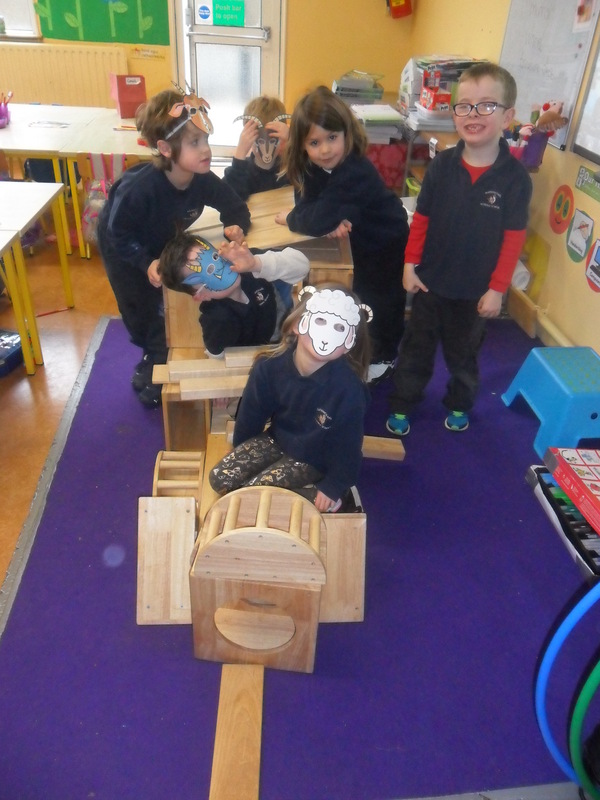 They also created The Three Billy Goat’s Gruff’s bridge before re-enacting the story using their bridge and masks of the main characters. 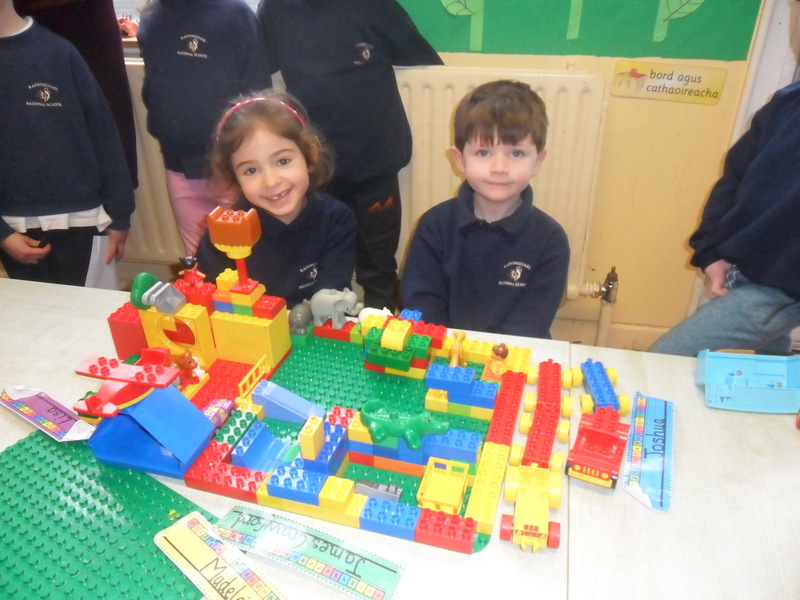 They also built a medieval castle from Lego at the Small-World Area. 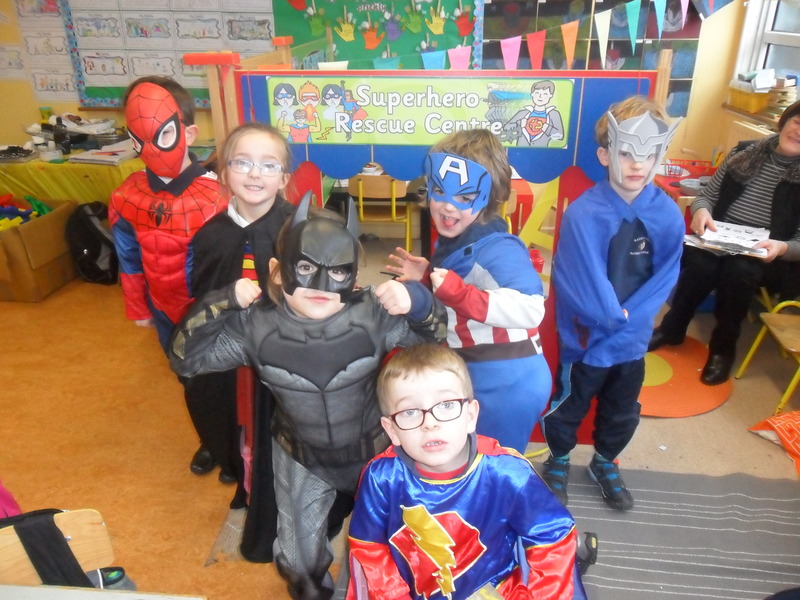 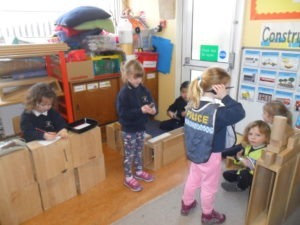 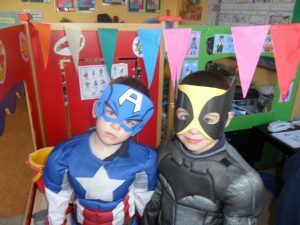 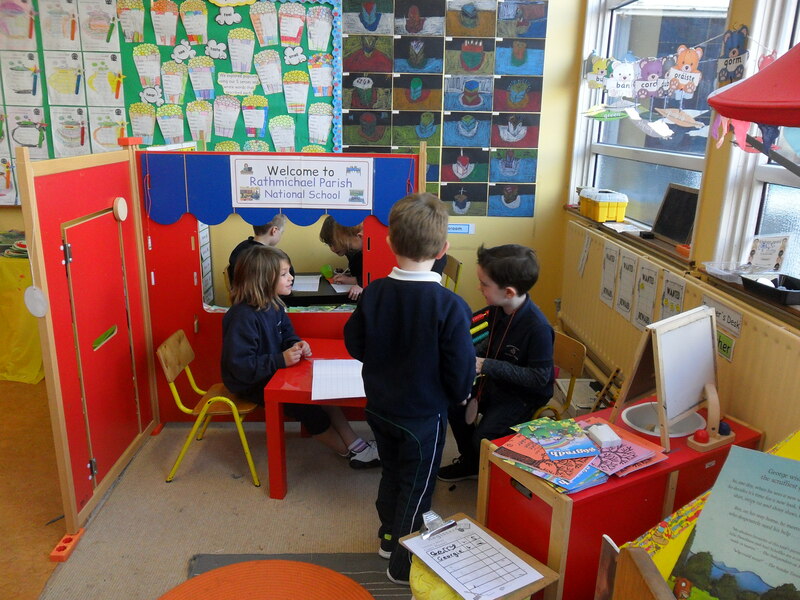 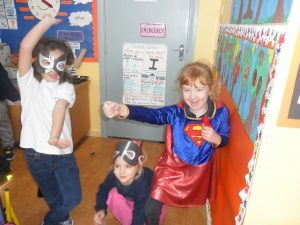 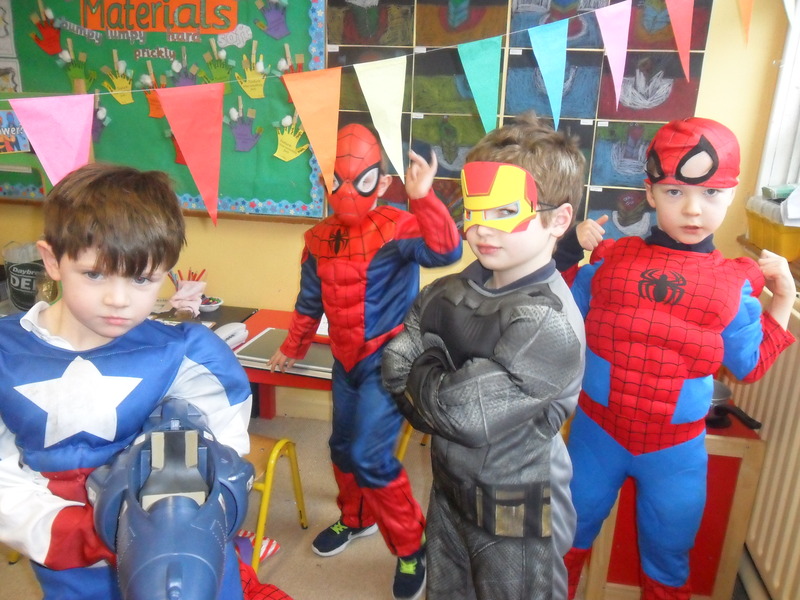 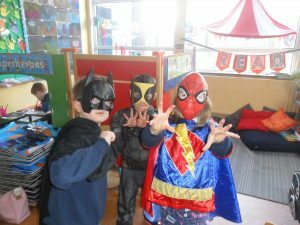 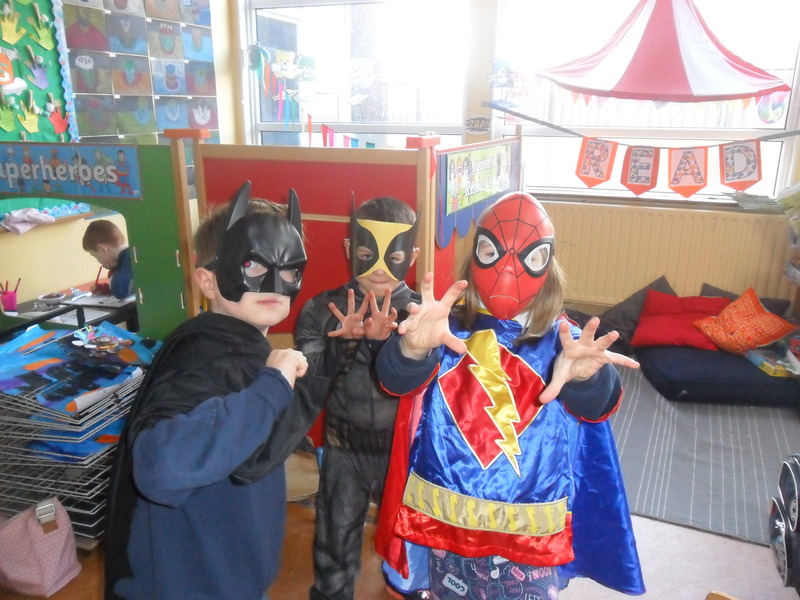 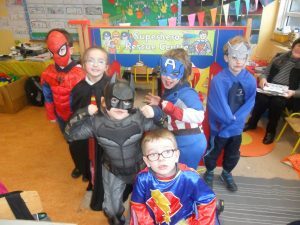 At the Home Corner the children had the opportunity to act out various characters in The Castle and at The Superhero Rescue Centre, where they had to design a superhero passport which gave them super powers and they were sent on lots of important missions. 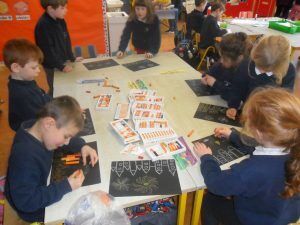 Oil-pastels were used to draw and colour a picture of a castle using 2D shapes inspired by Paul Klee’s ‘The Castle and The Sun’ at the Art Table. Also at the Art Table we used masking tape to make an imprint of the shape of The Three Billy Goat’s Gruff‘s bridge on paper before painting a background, peeling off the tape and adding a troll. Finally we all became superheroes when we painted our ‘Superhero Cityscapes’ and coloured in our own superhero costume to attach our faces to and fly. 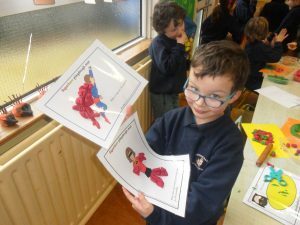 These superhero pictures are up on display outside our room so make sure to have a look. 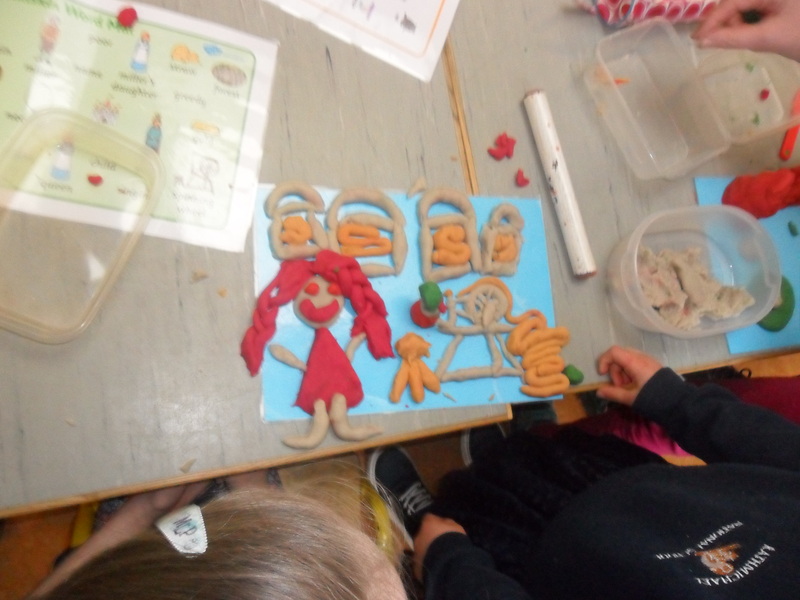 Finally, we sculpted ‘fairytale characters and scenes’ and ‘superheroes and villains’ out of play-dough. Here are some pictures of all our hard work. 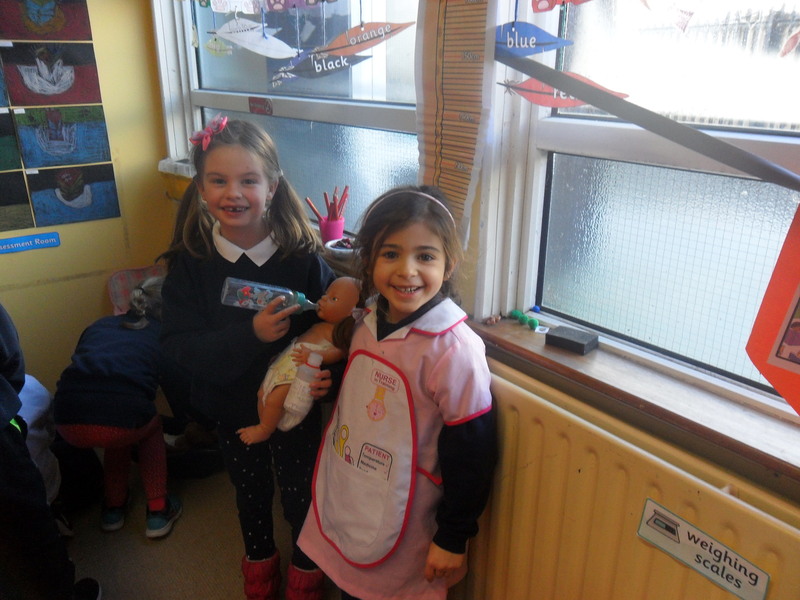 The theme for January’s Aistear was Our Family. 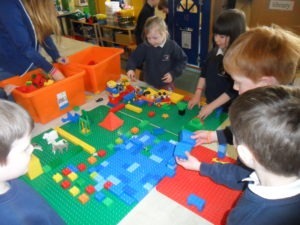 This is a great topc with lots of learning involved and the children really enjoyed it. 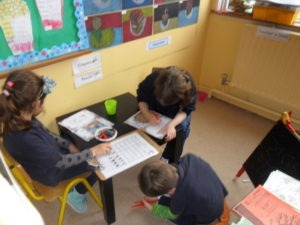 During the month the children discussed and identified the different members and various roles within a family and recognised their own place within their family. 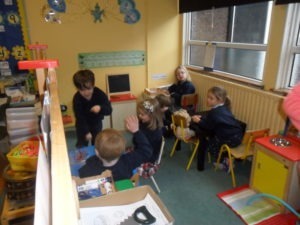 We read and discussed two lovely stories called ‘Cave Baby’ and ‘Seen and Not Heard’. We learned all about the different stages of the human life cycle and the development that takes place at each stage. 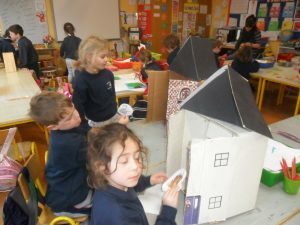 We examined the different types of homes that people can live in, the similarities and differences between homes in the past and present and labelled the features of a house. 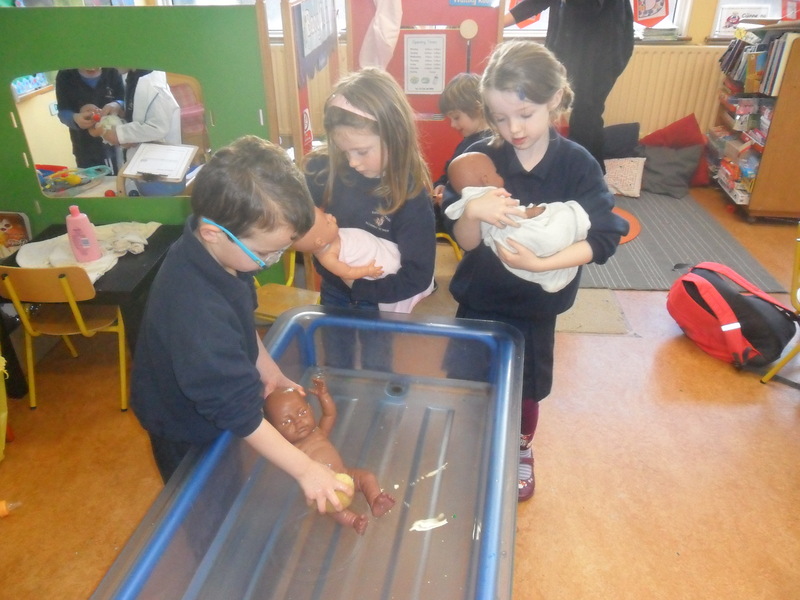 For the first week we were learning all about caring for babies and each child had the opportunity to take on the role of caring for and bathing a baby at the Water Table. 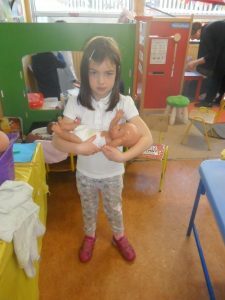 is being careful to hold the baby correctly and support their head. 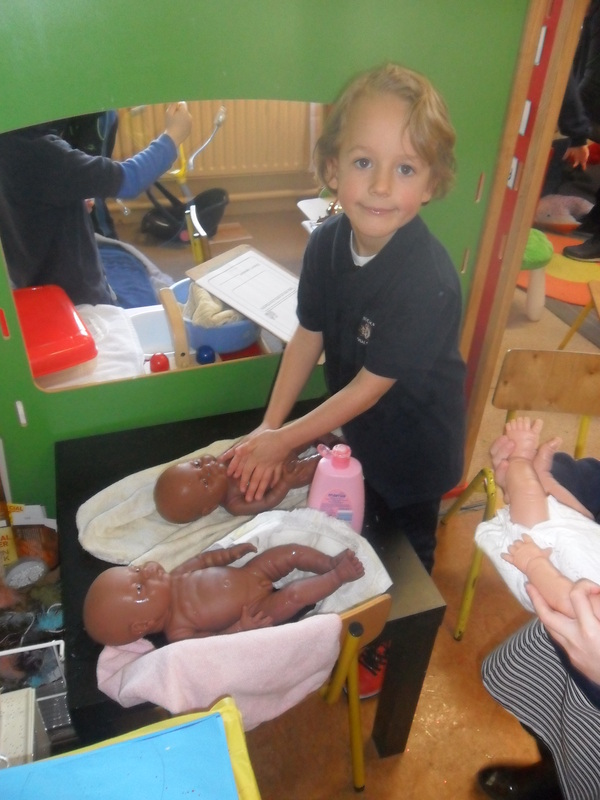 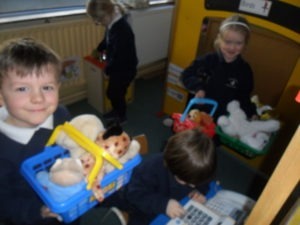 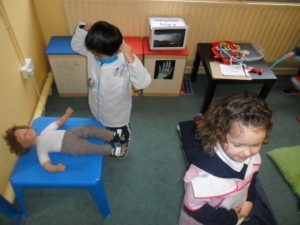 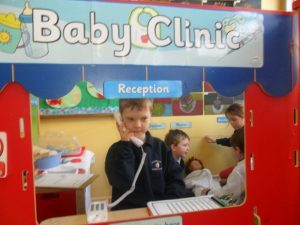 The children learned how to hold a baby correctly to support it’s head, how to wash and dry the baby, how to change a nappy, feed and wind the baby at this station and at The Baby Clinic in the Home Corner. 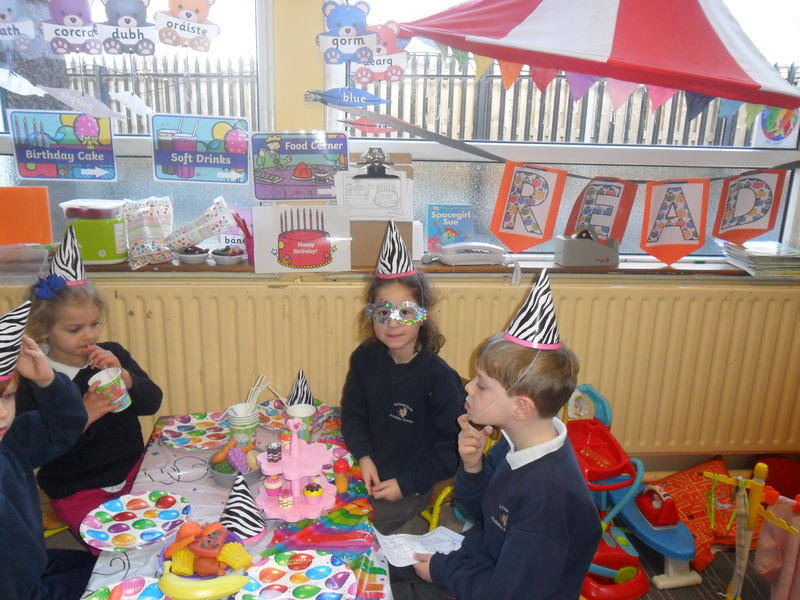 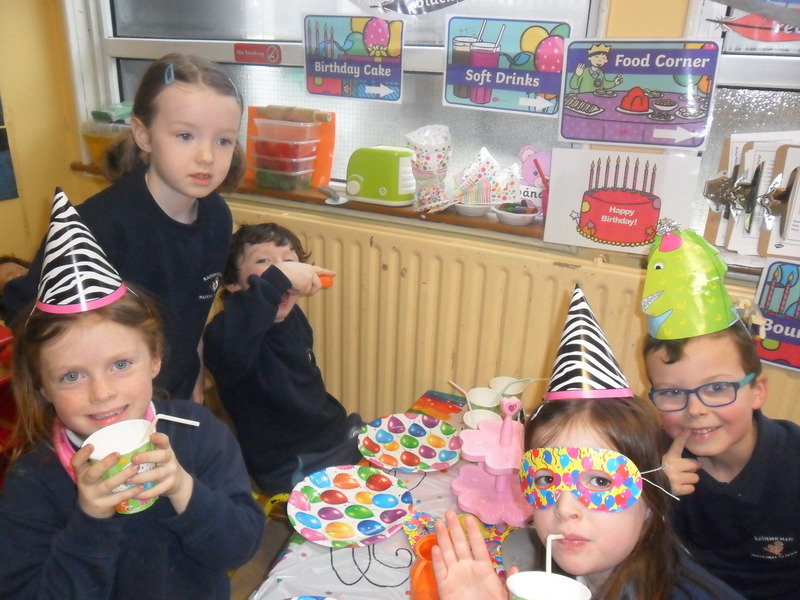 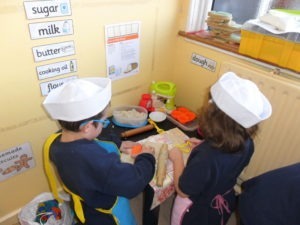 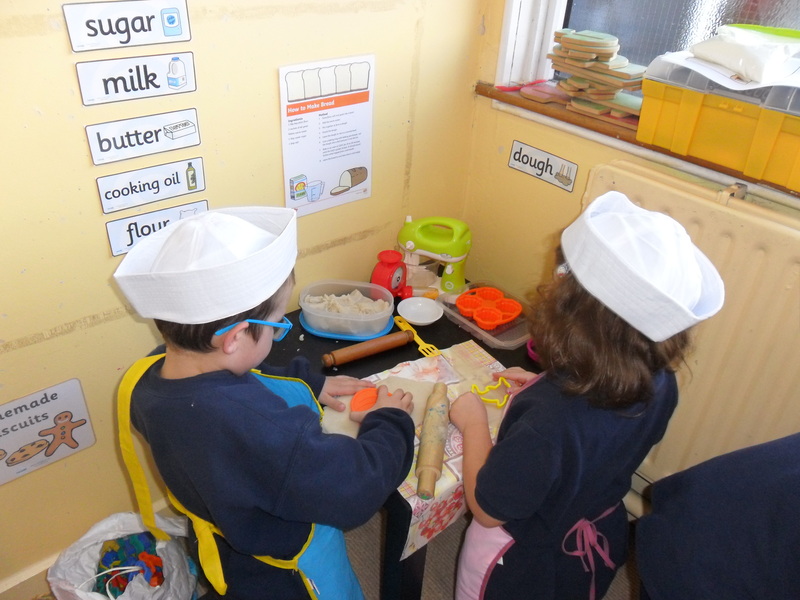 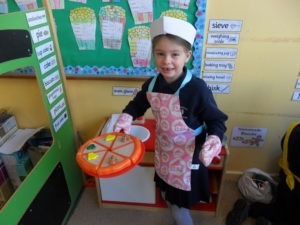 Also in the home corner this month the children took on a variety of roles in The Home and at The Birthday Party. 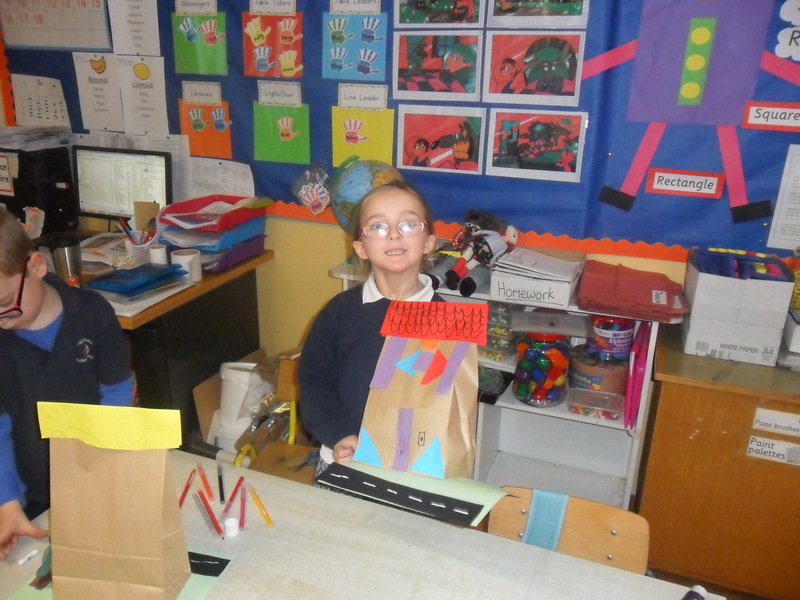 At the Art Table they used oil pastels to draw a picture of New Year’s Eve fireworks over a city, they designed a 3D paper bag house using coloured card and a brown paper bag and completed a family tree by painting the tree and cutting out and sticking pictures of family members onto apples on the tree. 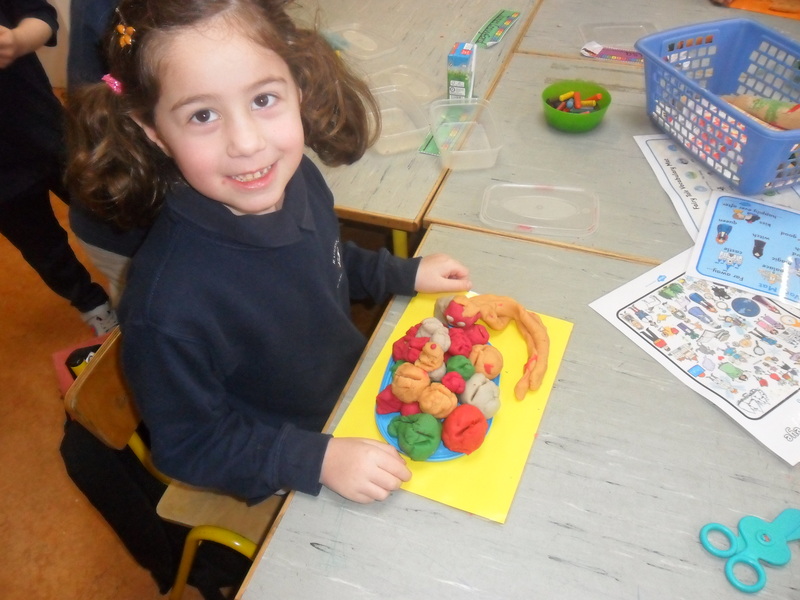 The class also sculpted their families out of playdough. 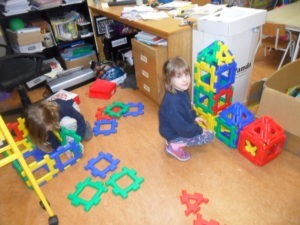 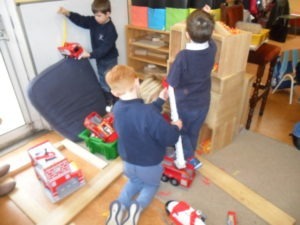 At the Construction Corner the children were building houses using the large wooden blocks and the new plastic building blocks and a toy shop where they had to sort real artifacts (various old and new toys) into two sections; old toys from the past and new toys. Have a look through the pictures of us hard at work below! 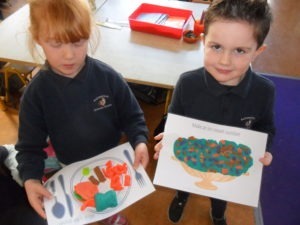 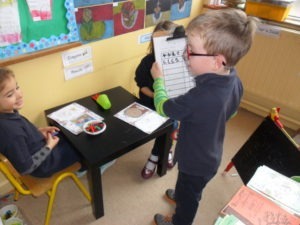 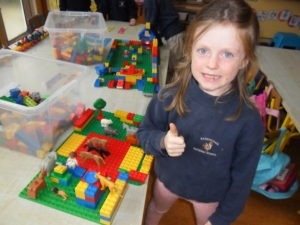 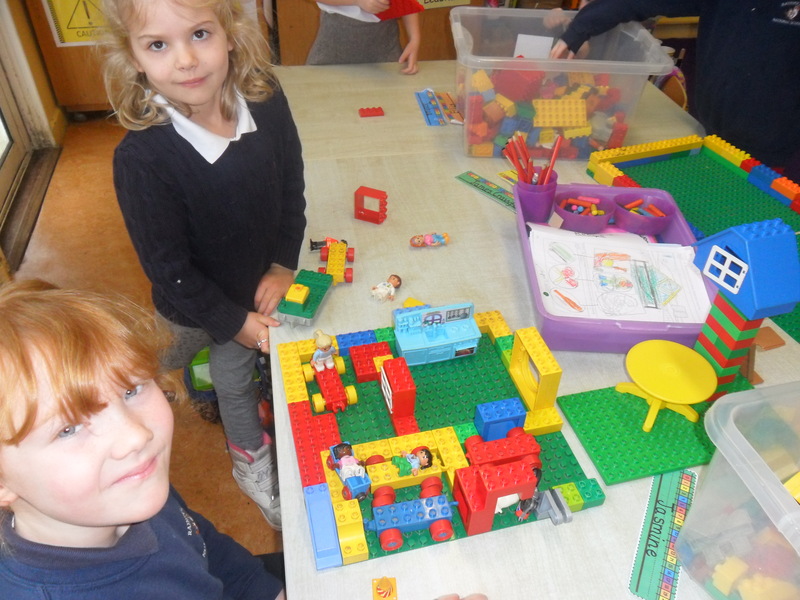 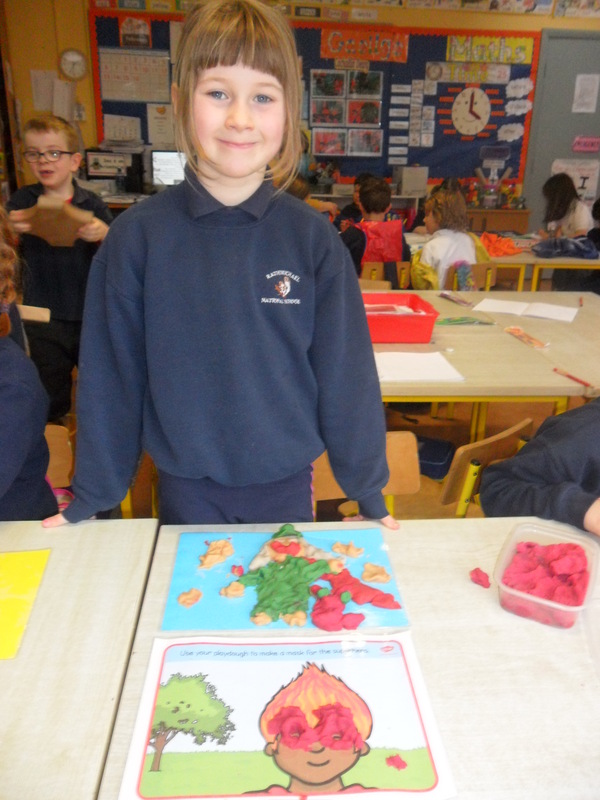 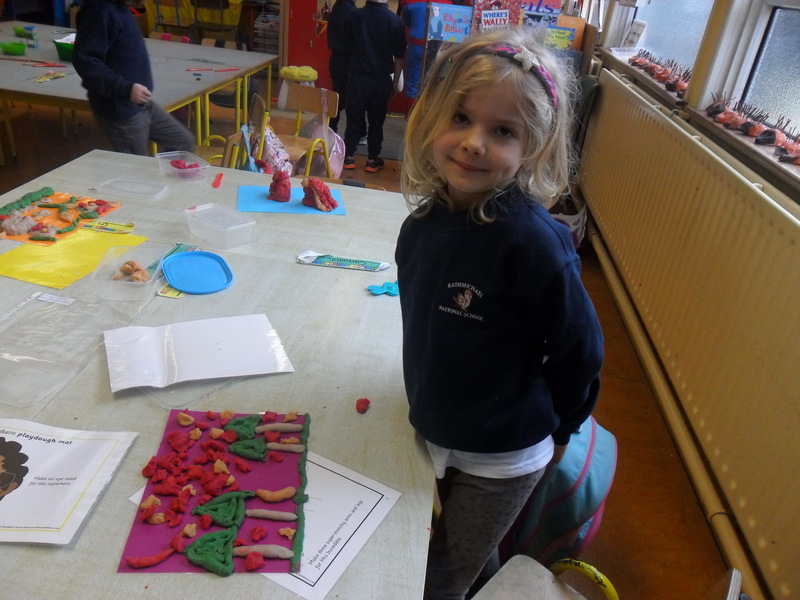 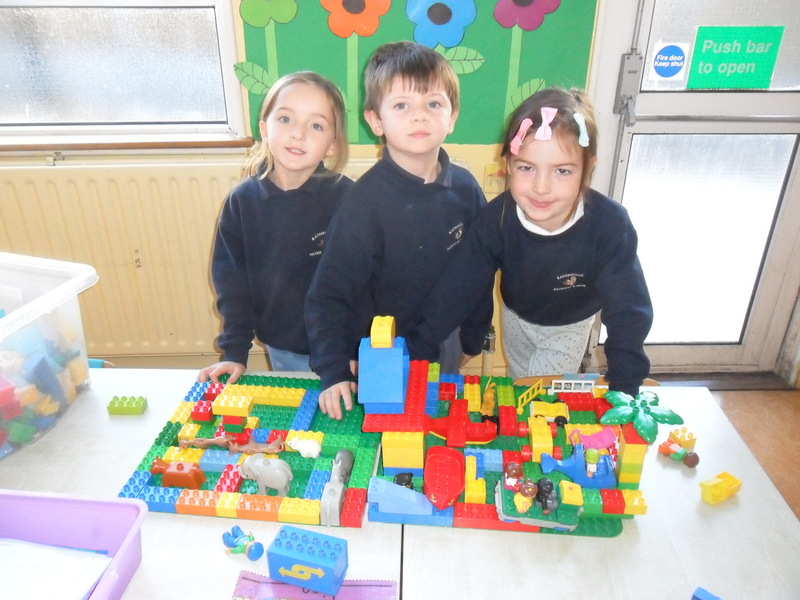 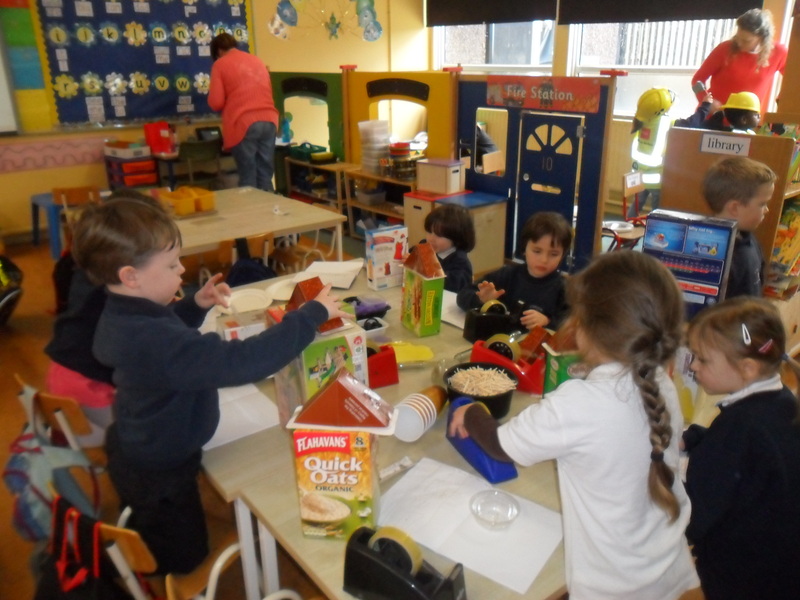 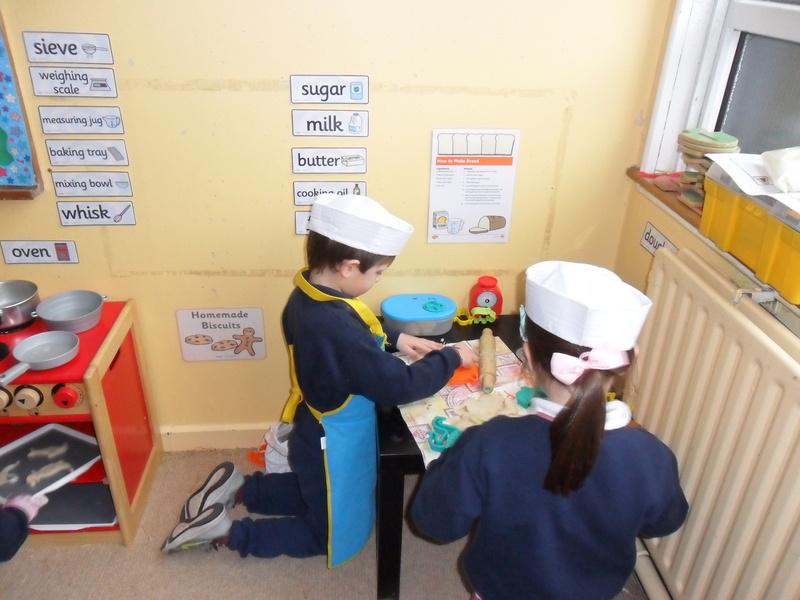 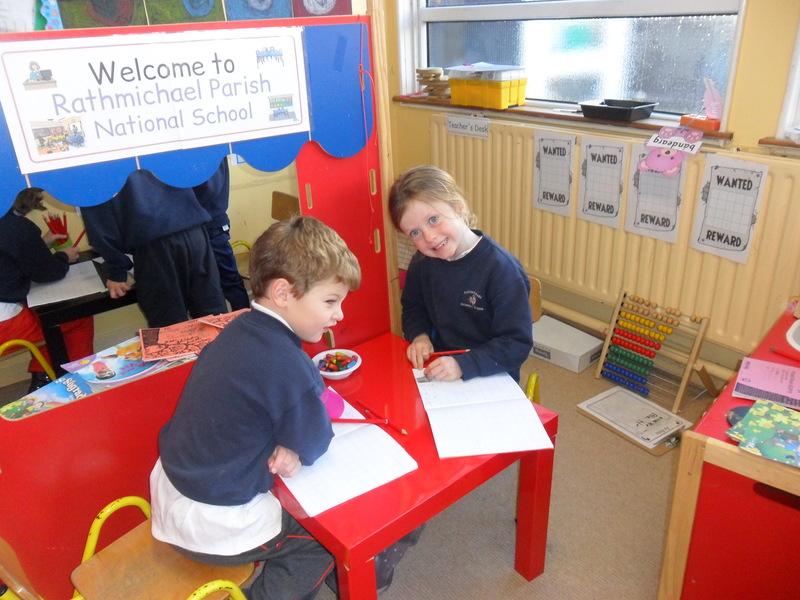 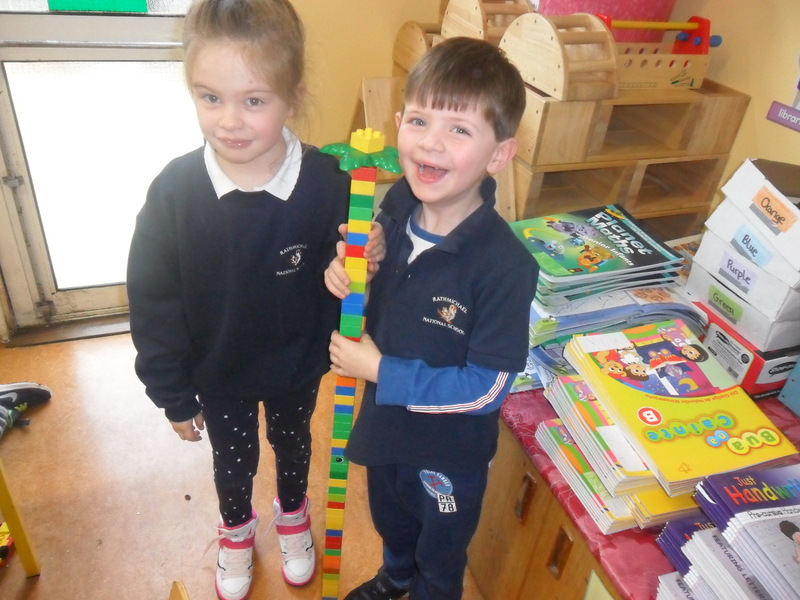 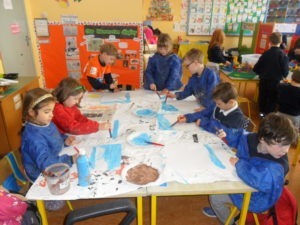 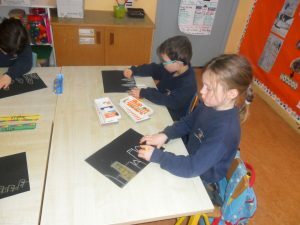 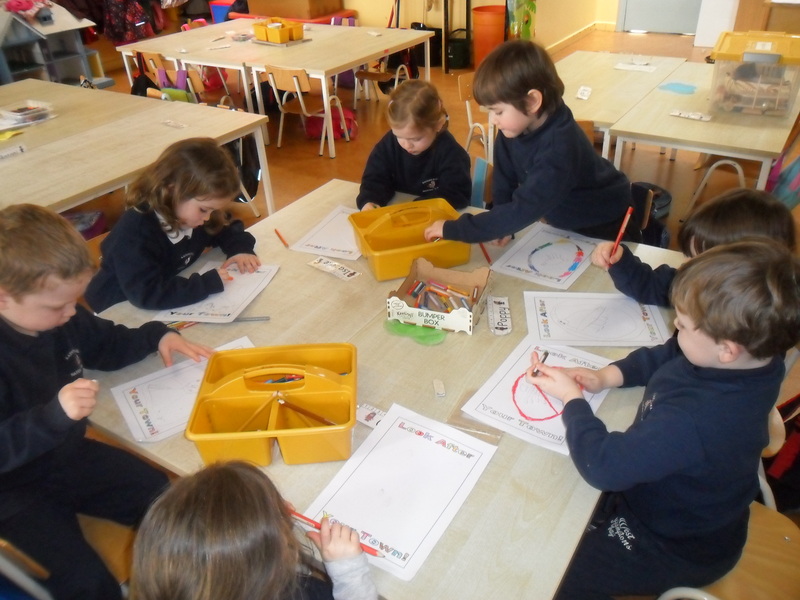 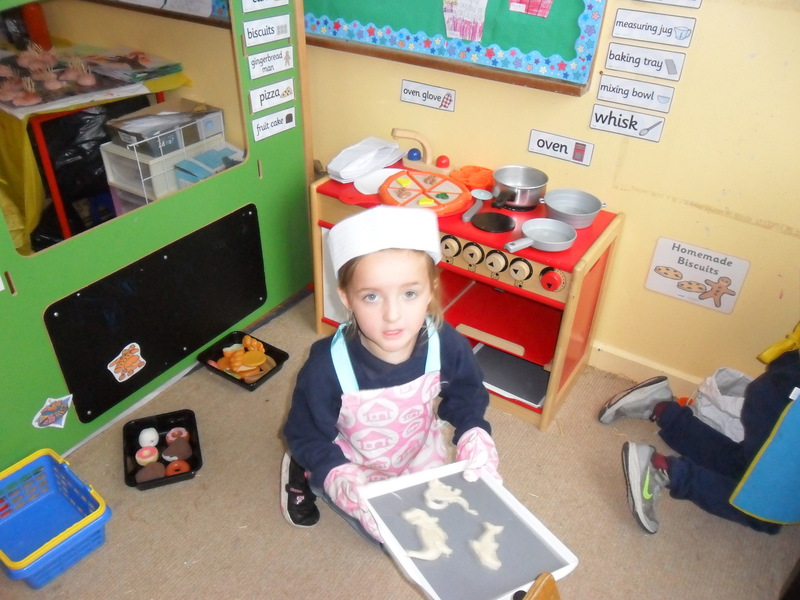 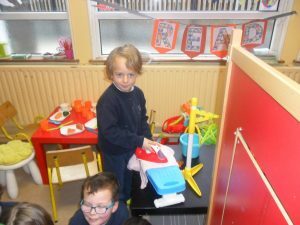 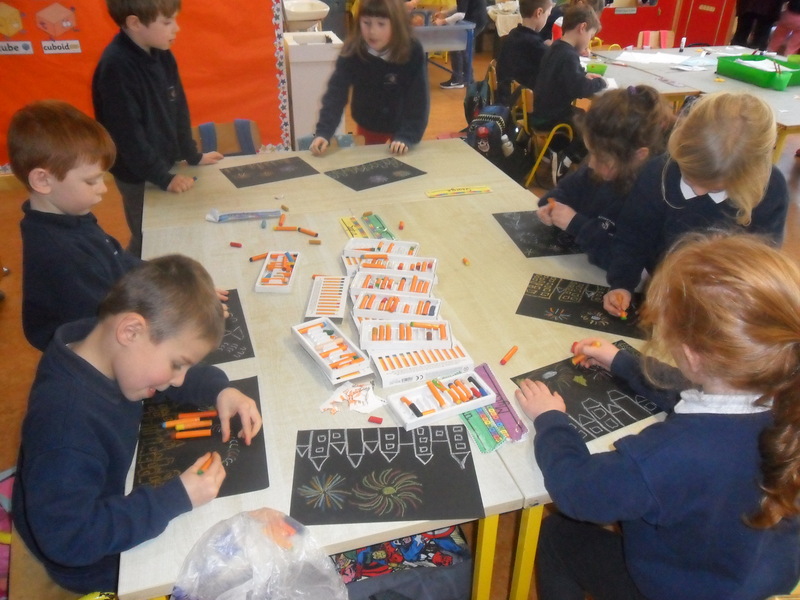 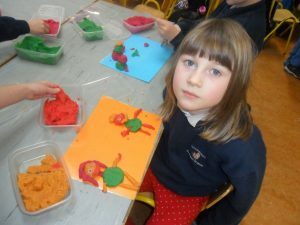 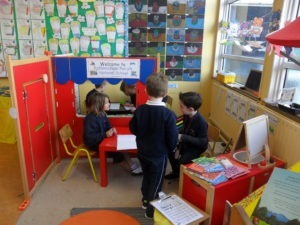 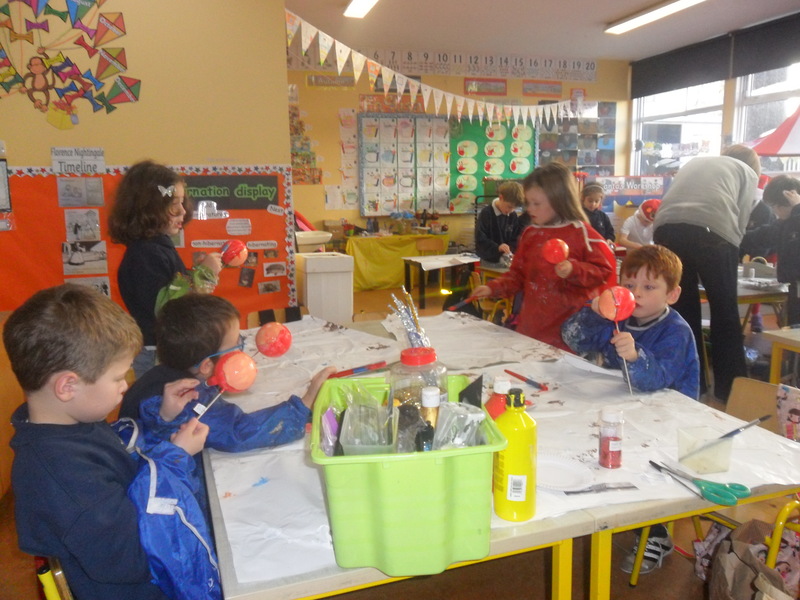 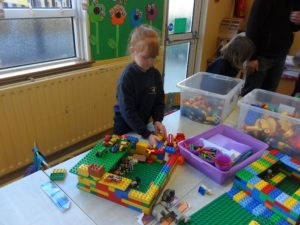 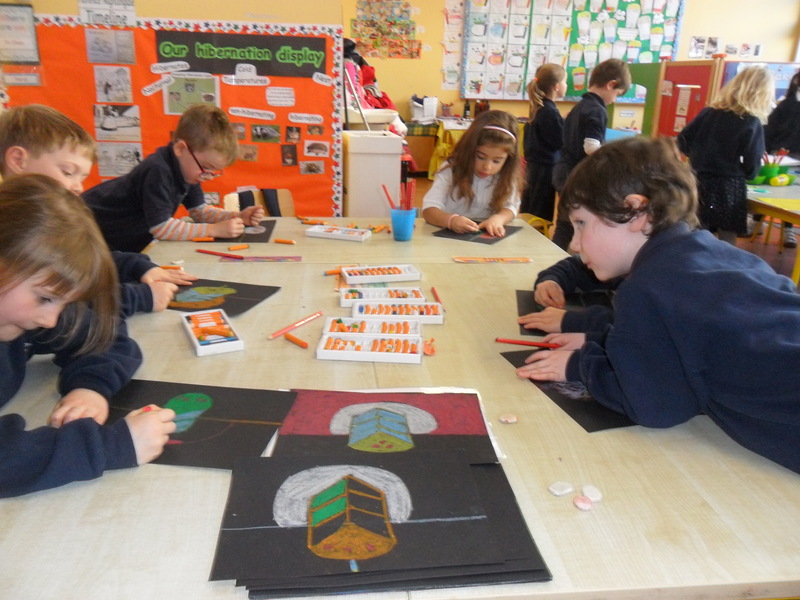 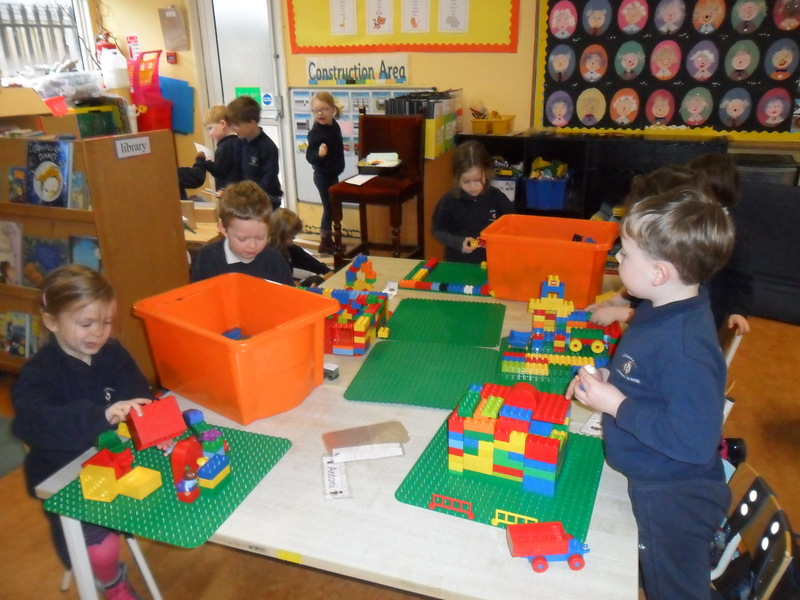 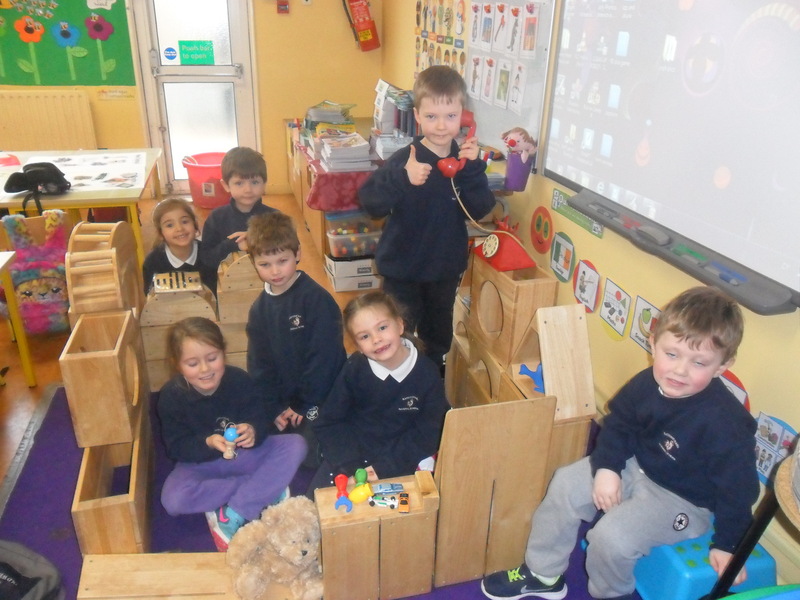 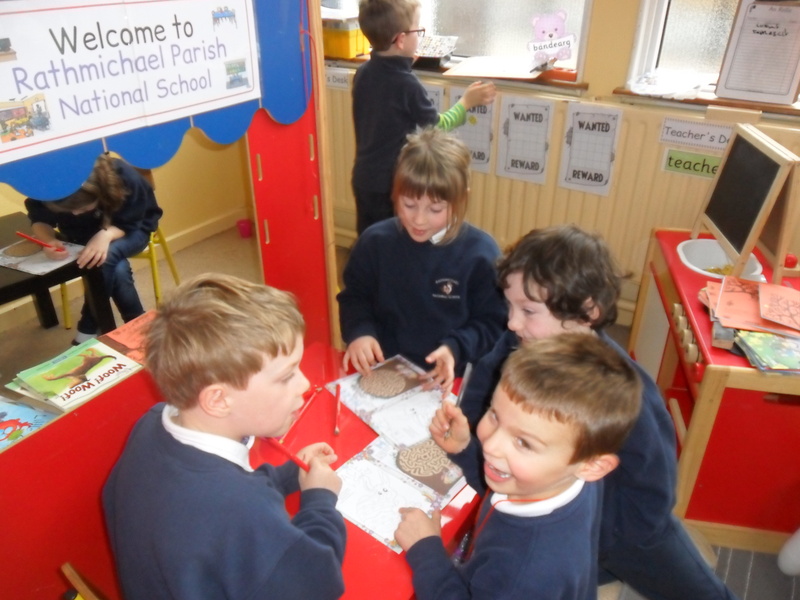 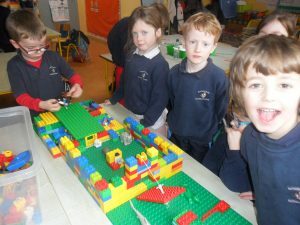 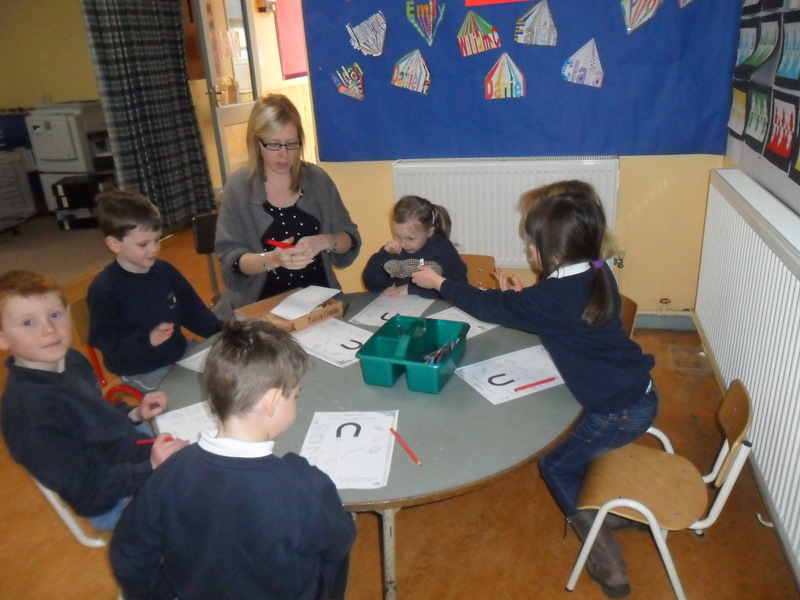 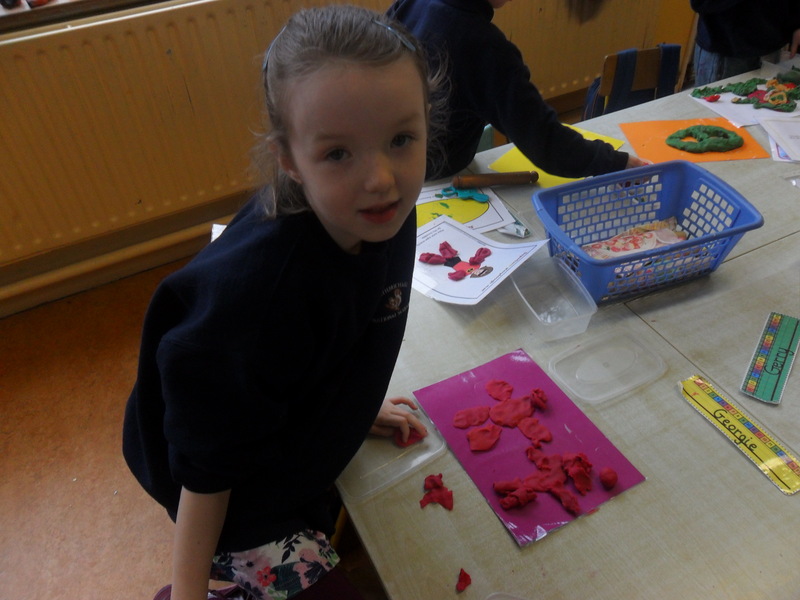 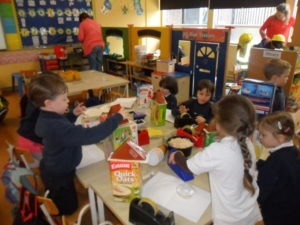 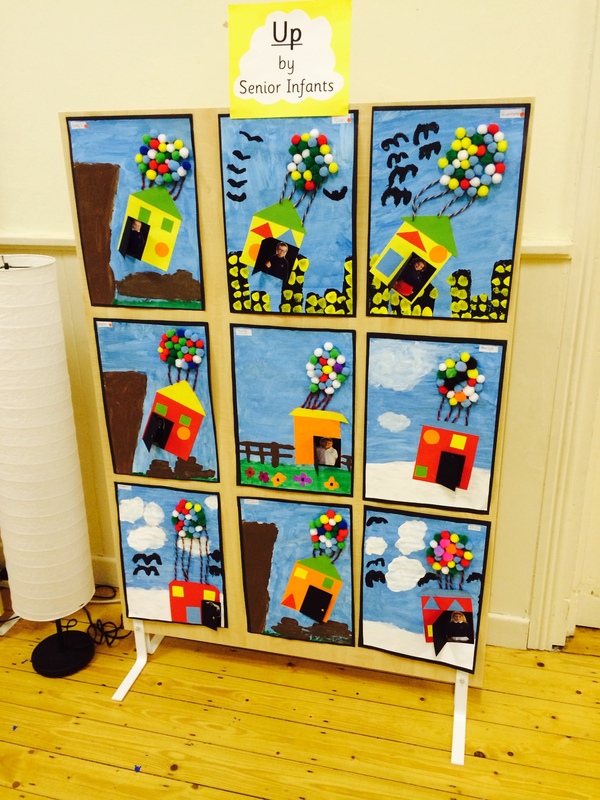 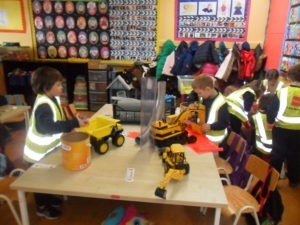 During the month of November Senior Infants were focusing on ‘Our Locality’ and we were very busy! The class learned all about the different types of buildings in our community and the jobs involved in these. 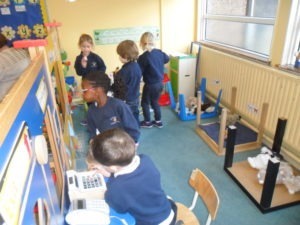 We looked closely at our own school and the activities and jobs within it. We read the story ‘The Town Mouse and The Country Mouse’ to compare and contrast living in a town/city or the countryside and we discussed ways to care for the environment and our communities. 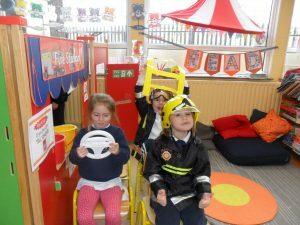 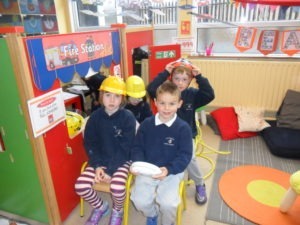 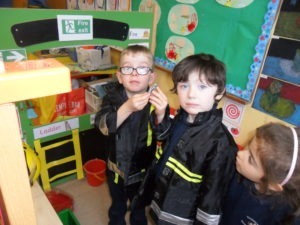 At the Home Corner the children had the opportunity to play as various characters and explore the jobs in The School, The Bakery, The Fire-Station and The Post-Office. 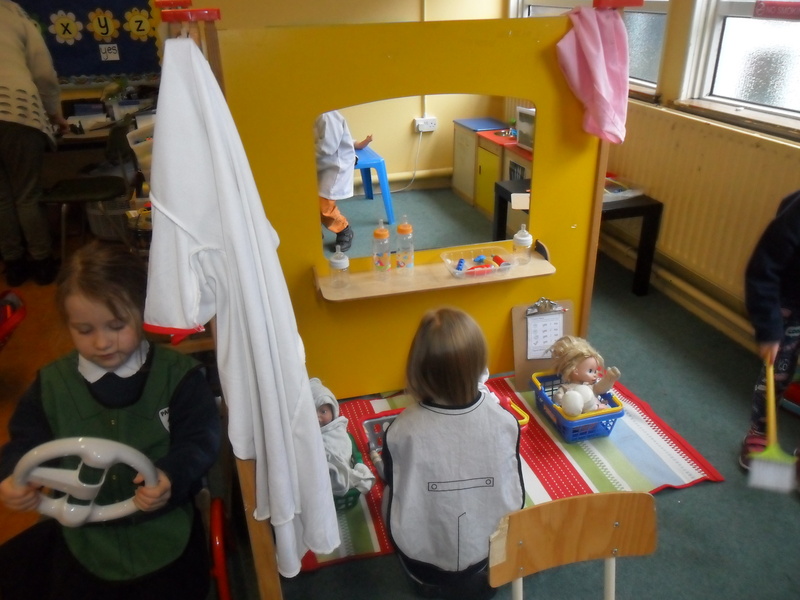 Each week was a huge success as they all required very different roles and scenarios to be acted out. 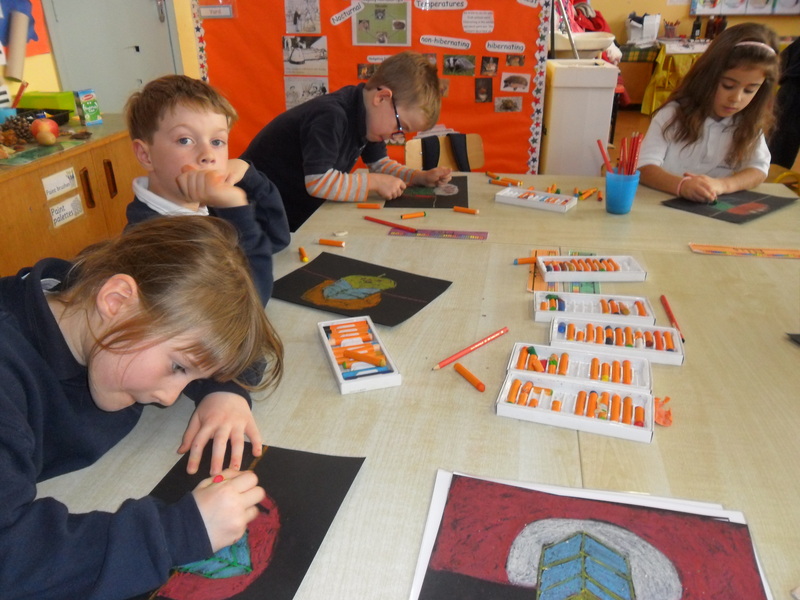 At the Art Table the children looked at the work of Wayne Thiebaud whose work is largely focused on paintings of food and cakes. 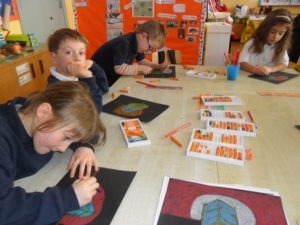 The children then drew a slice of cake from observation and coloured the different layers and plate using oil pastels. They looked fabulous and of course very tasty! 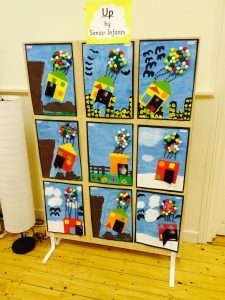 We then spent the further three weeks of the month working on a collage inspired by the movie ‘Up’ for the Art and Wine Evening where we sold all our works of art and they looked great. At the Playdough table the children were asked to create playdough meals and at the small-world area they designed the playground of their dreams, a shopping centre and a postal run (village) with Lego. 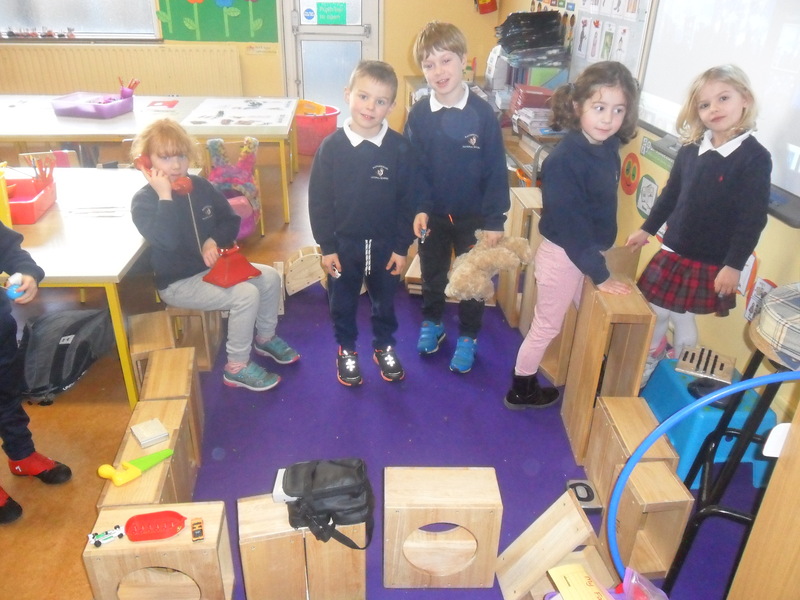 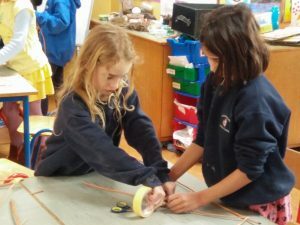 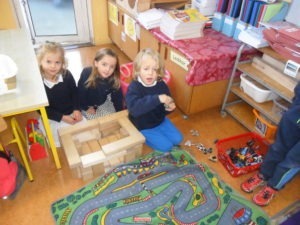 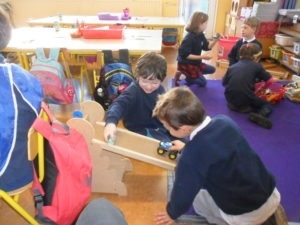 With the large construction blocks the children built a garage and used toy cars and a road mat to act out scenarios, while another group tested the toy cars on the friction ramp with various surfaces and heights to explore forces and gravity. 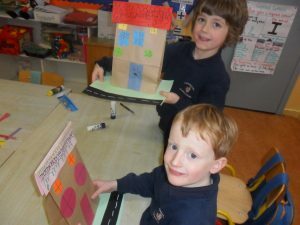 They also created a village of burning buildings with res paper flames to rescue using our fire-trucks and emergency vehicles. 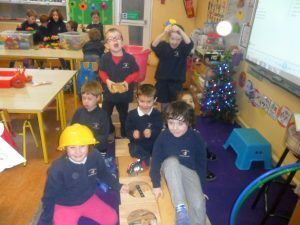 We also explored the dangers of electricity in the home and conducted experiments with magnets to find out which everyday items were magnetic. We were very lucky to have a number of people to come into our classroom as guest speakers and tell us all about their jobs. 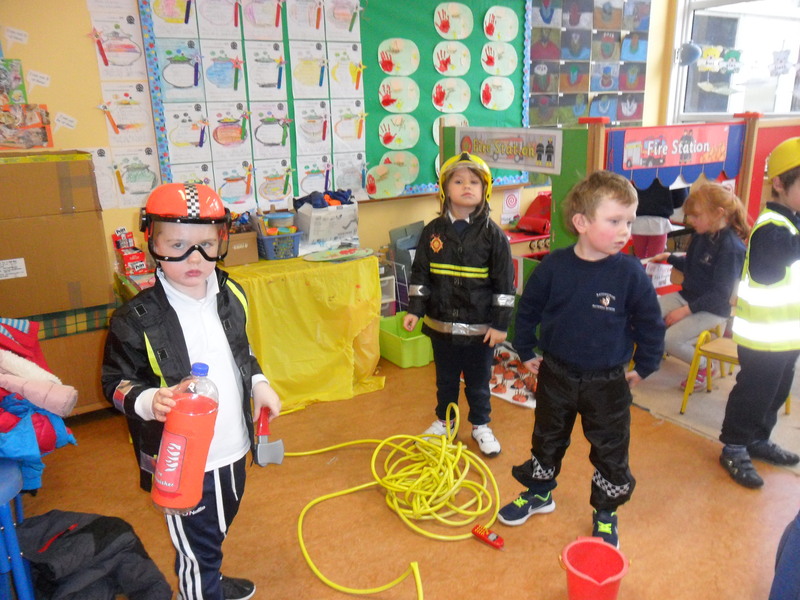 Firstly we were very excited to have Ben’s uncle in, who is a drone expert, and he brought a fireman with him who works for Dublin Fire Brigade. You can read all about their visit and see photographs further down the page. 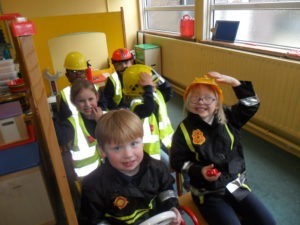 Later in the month we also had three parents in who explained their jobs in the community. 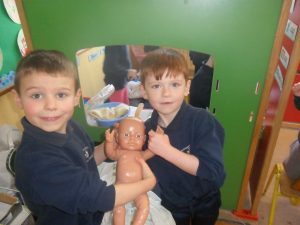 Conall’s mum told us all about her job as a physiotherapist, Daniel’s mum told us about being a biomedical engineer and Ollie’s mum had some lovely stories of how she cares for people as a nurse. 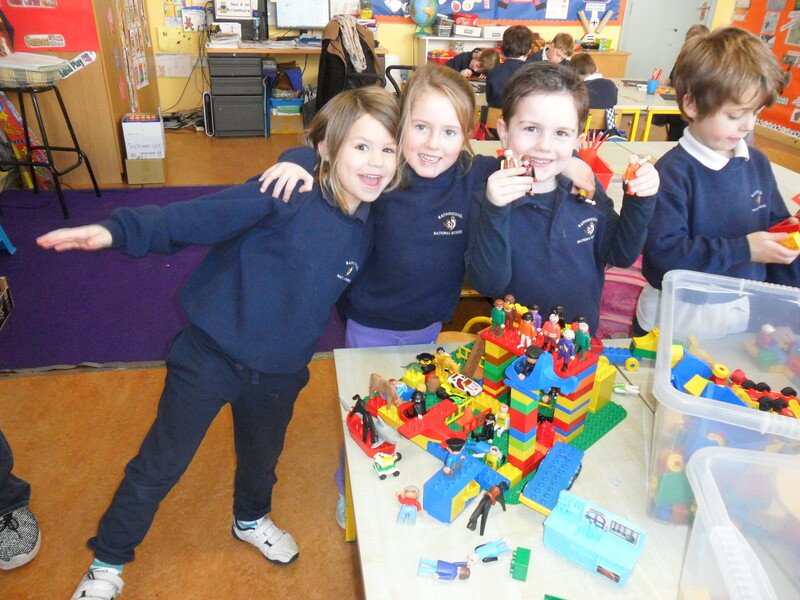 We are extremely grateful to all our visitors and we learned so much, Thank You!! 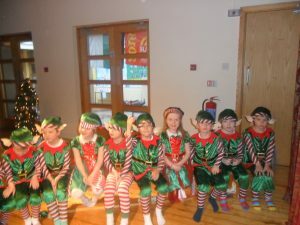 In December we only had two weeks of Aistear as we were very busy with practicing for our concert, writing to Santa and going to the panto. The class read some lovely Christmas stories during the month, including The Gruffalo’s Child and The Jolly Christmas Postman. 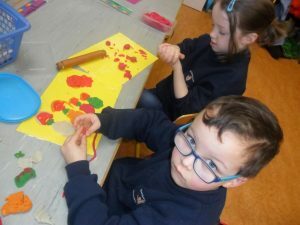 We examined the types of materials found in presents and created our own texture hand prints by matching a range of materials to descriptive words. 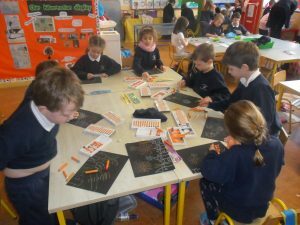 We were discussing the type of weather we have in winter, signs that winter is here and changes that occur at this time of year before we wrote our very first acrostic poem on the word ‘winter’. In the Home Corner this month we took on a variety of special roles at The Christmas Post Office and Santa’s Workshop, both of which were lots of fun! 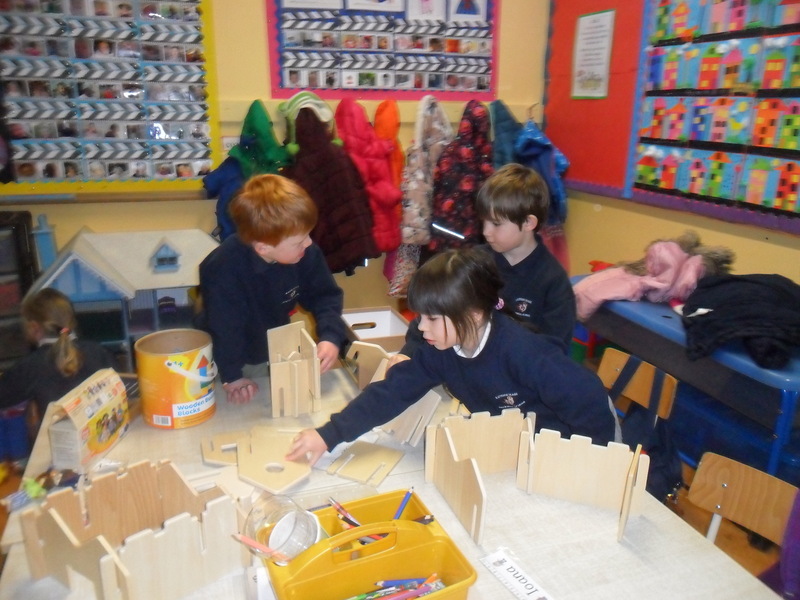 At the Small World Area we built the nativity scene with the stable, Mary, Joseph, Jesus, the three wise men, the angels and the shepherds. We were very familiar with the story of Jesus’ birth as we had spent lots of time over the course of the month listening to and discussing stories about it in RE. 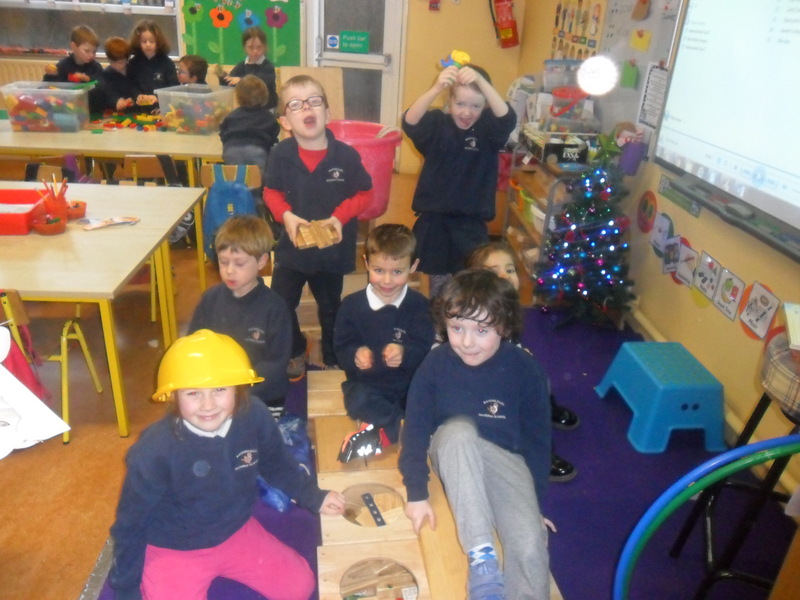 We also worked really hard on making Junk Art sleighs using plastic containers, bottle tops, round lids and gold strips of cardboard as another Small-World activity. 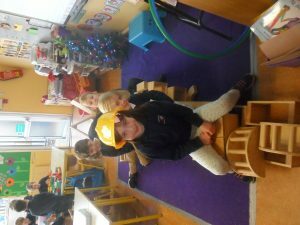 At the playdough table we made lots of imaginative Christmas presents and decorations and we constructed Santa’s sleigh and grotto from large wooden blocks. 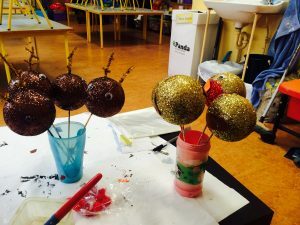 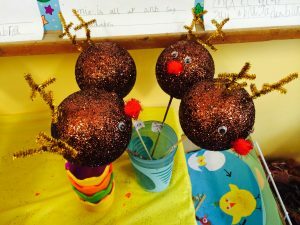 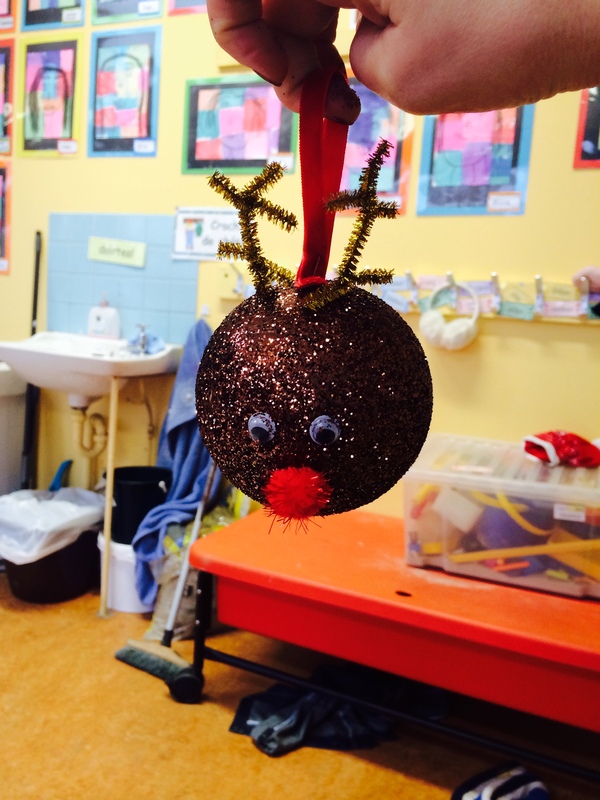 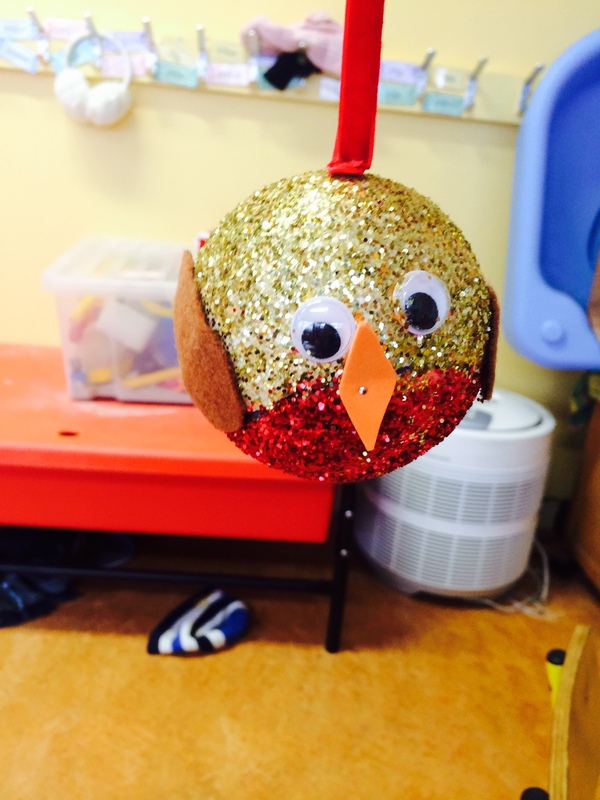 In art we created lovely glittery Christmas baubles to take home and put on our trees and painted a wintery scene with willowy trees and Christmas robins. 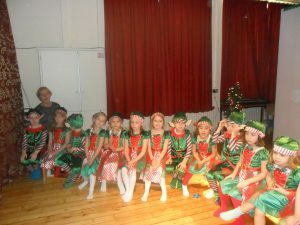 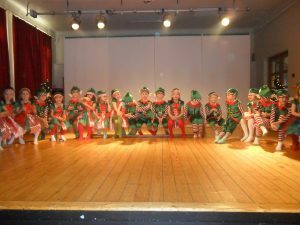 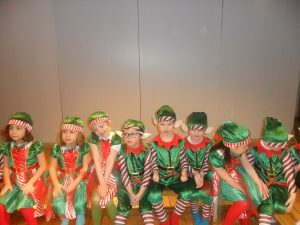 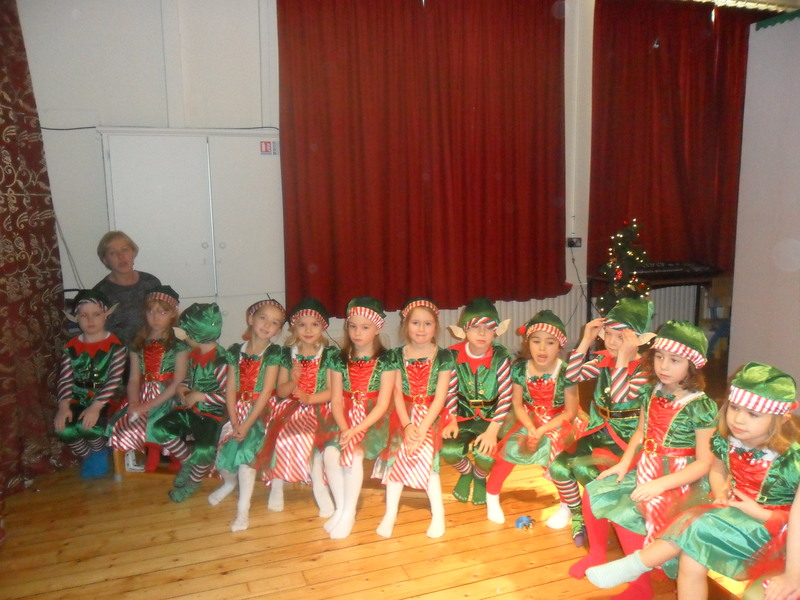 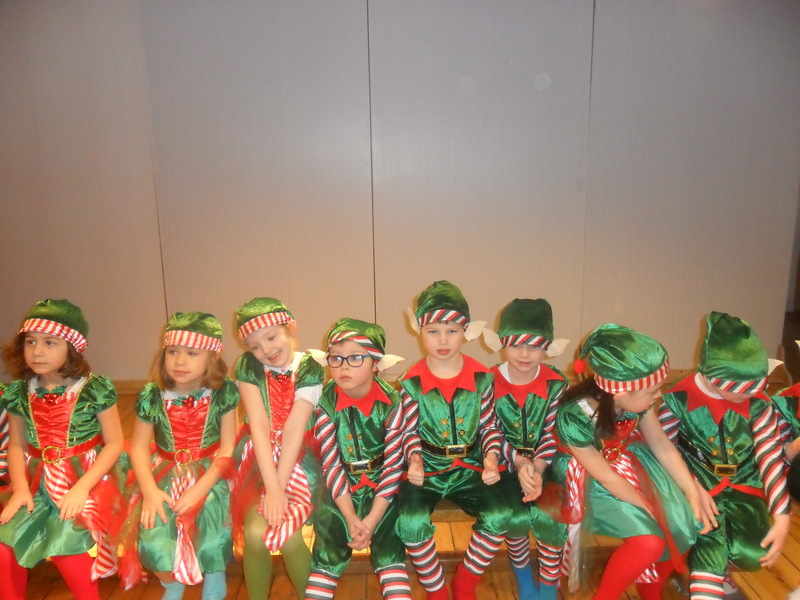 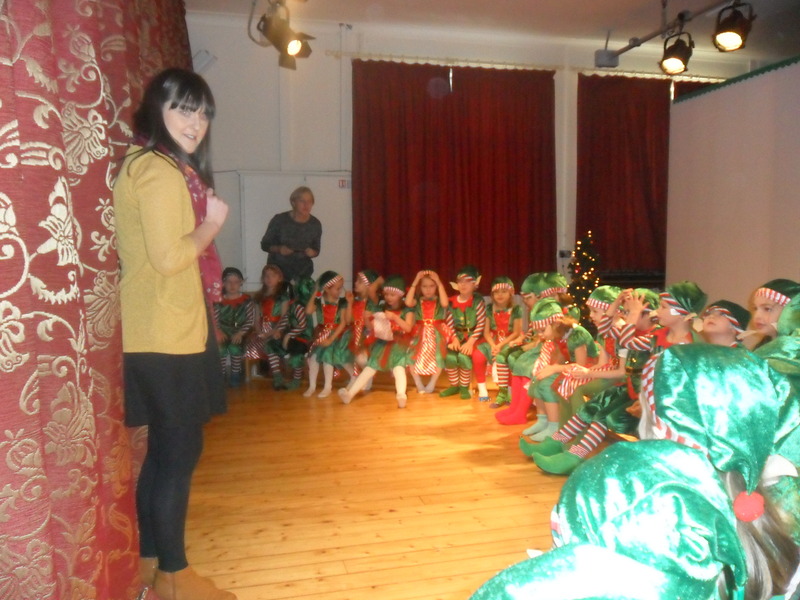 However, the highlight was definitely the Christmas concert where the class performed four songs for their families on stage in the hall, all dressed up as elves. They did a really good job remembering all the words and it was a lovely show! Please look through the photographs of us hard at work. This month’s Aistear theme is ‘My Locality’. 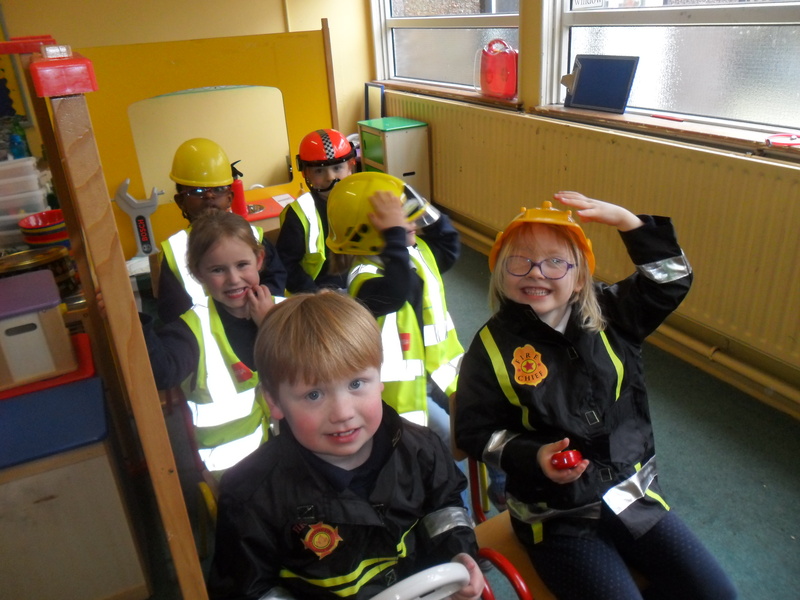 The children have been learning about the different buildings and places in the locality and the various jobs that people do. 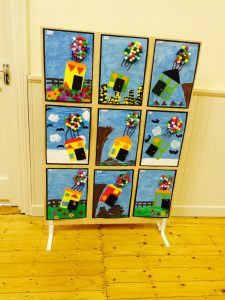 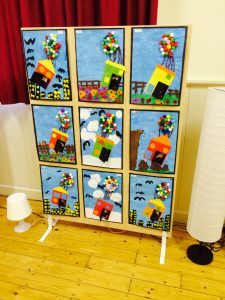 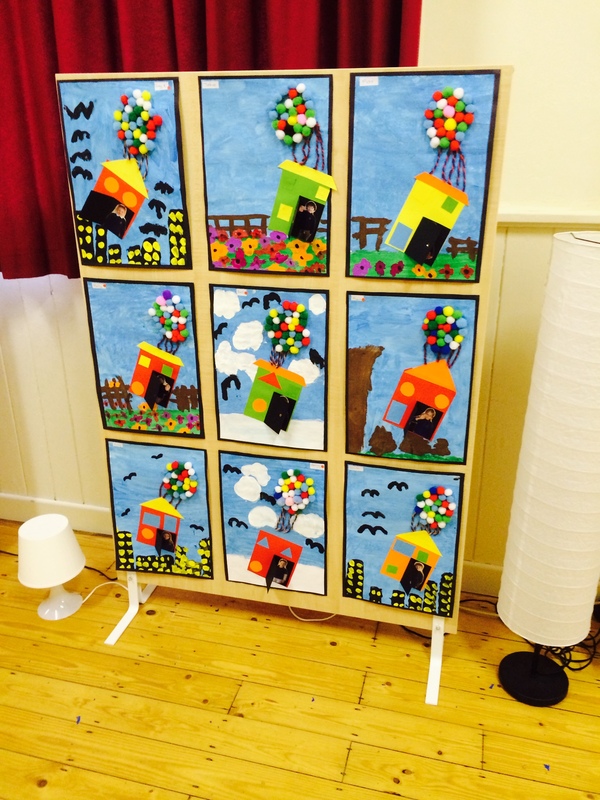 In the Art Corner the children have been making street scenes from coloured paper, posters to protect the local environment and junk art buildings that they have spotted in the locality. Frank O’Neill was our guest speaker this month as he is on the Tidy Towns Committee. 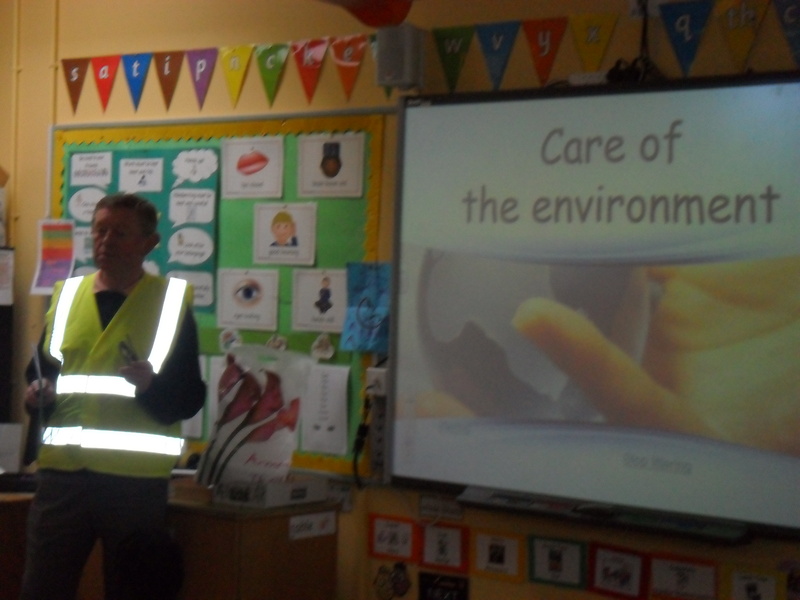 He told us all about how we can keep our locality clean and tidy. 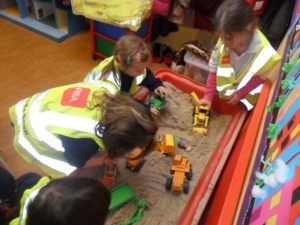 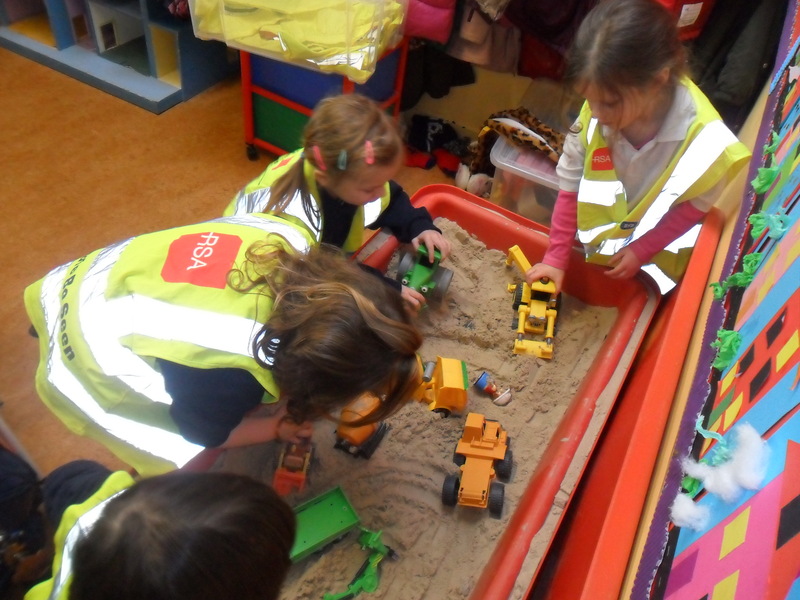 They have been playing as builders in ‘The Construction Site’ at the Sand Table and they also experimented with magnets. 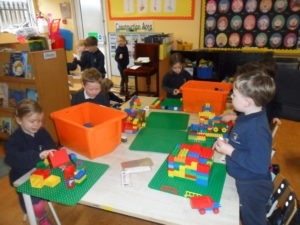 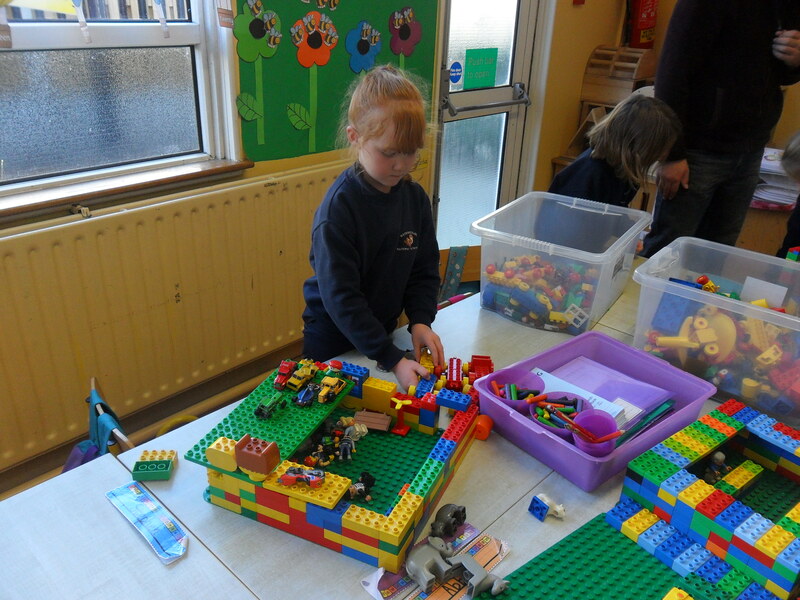 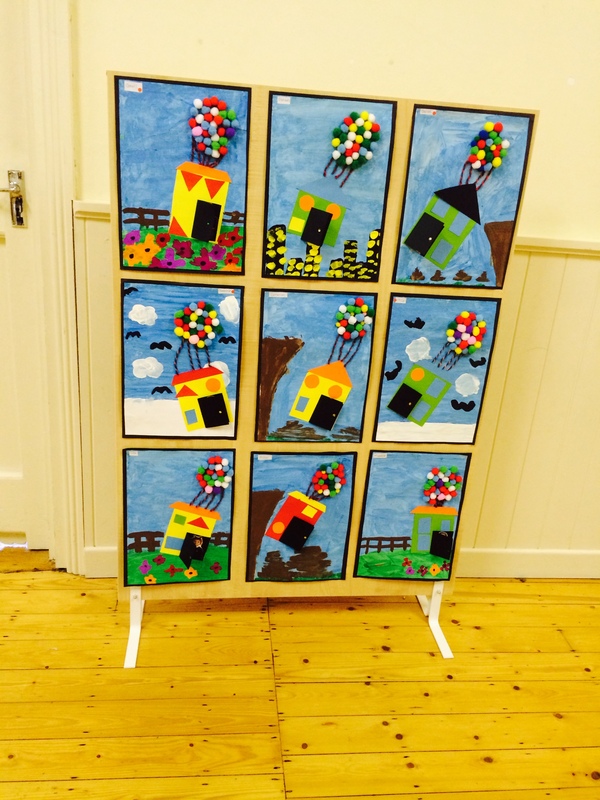 In Small World the children have been building towns and villages from Lego and the wooden boards. They also played with the Doll’s House, designed and built a park from Lego and played with the toy garage and fire-station. In the Home Corner the children took on different roles in ‘The Hospital’, ‘The School’, ‘The Cafe’, ‘The Post Office’ and ‘The Fire Station’. 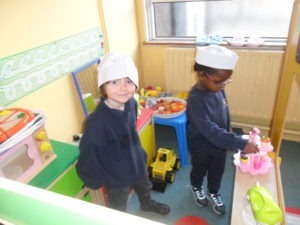 They loved learning about the different jobs that people do. In the Construction Corner, the children built a town and a police station. They also made buildings from Polydrons and experimented with objects that could be pushed or pulled.